The latest news 10.03.2015. Look for more information and pictures on the Estonian page. 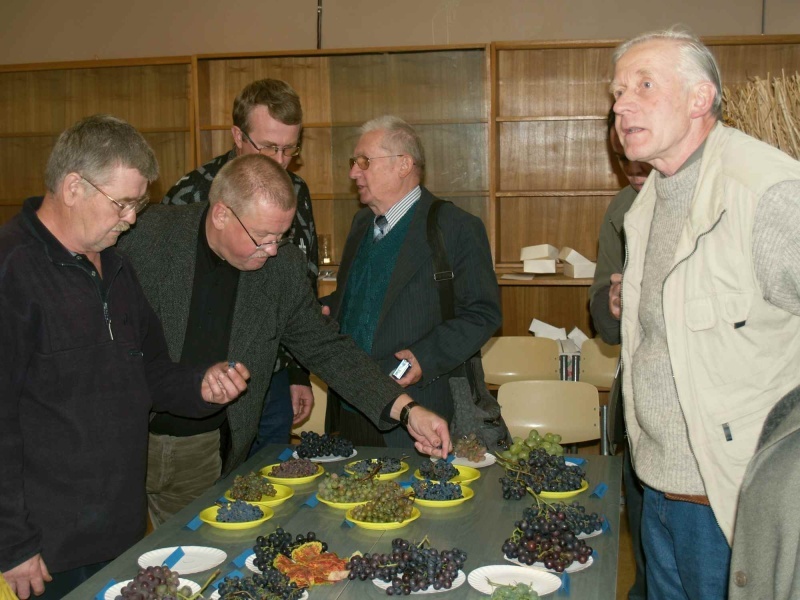 The Latvian Grape growers and winemakers association annual meeting will be held on March 14 in the Museum of Nature in Riga. Beginning is at 11 AM. There is occuring the 4th International Conference 11.-14.11.2015 in Nebraska (USA). 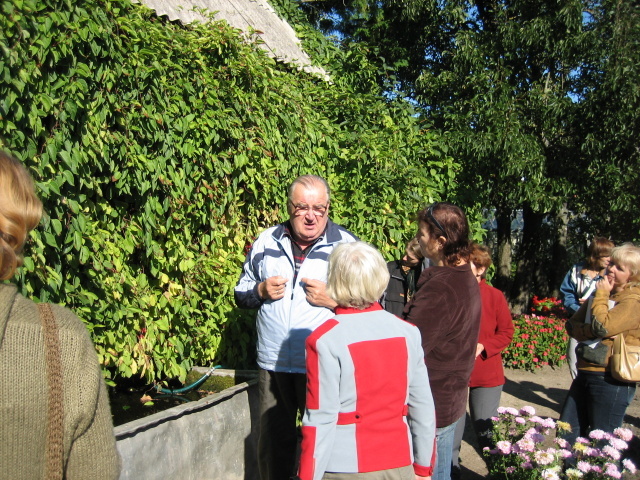 02.-04.10 - We visited with Raimu Aas Muhu Farm Winery. 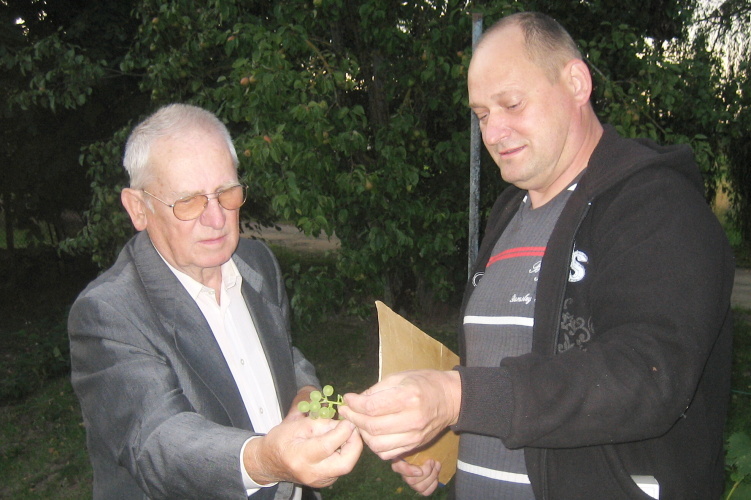 22.08 - A grapegrowers meeting-conference took place in Dviete devoted to Latvian grape-breeder Pauls Sukatniek’s 100-Anniversary. 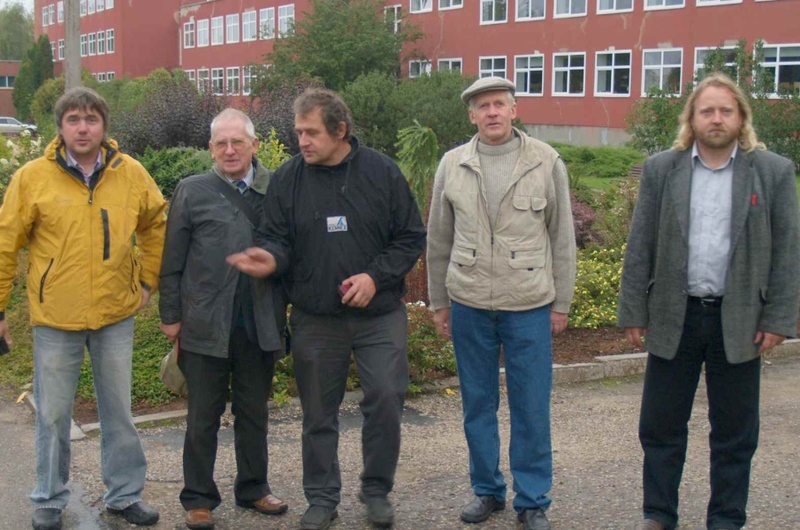 You can see on the photo made by Andris Dishlers Latvian breeder Gunvaldis Vesmins, Raimu Aas (Estonia) and Gvido Dobelis (Latvia). 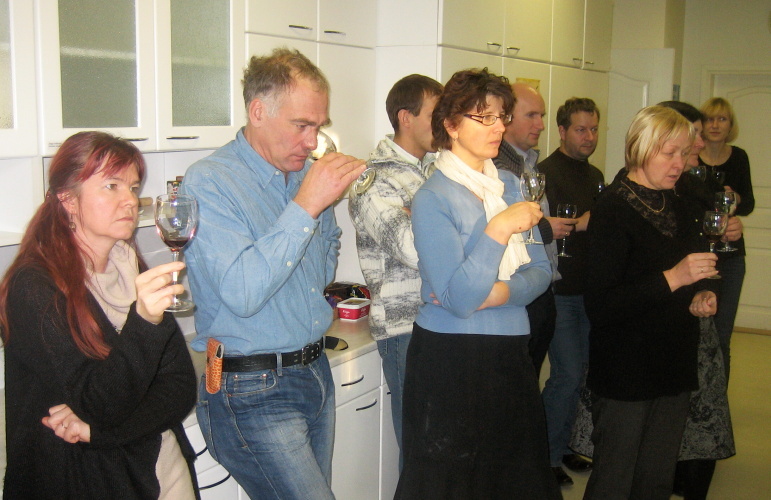 12.06 - Testing Estonian grape-wines made by Jaanus ja Tea Lajal in wine store Veinimaailm (cultivars 'Somerset', 'Bianca', 'Spulga', 'Blaue Burgunder', 'Rondo', 'Amurski'). 18.09.2013 - Juozapas Sruogius from Lithuania spent a day in Räpina and Võru county. 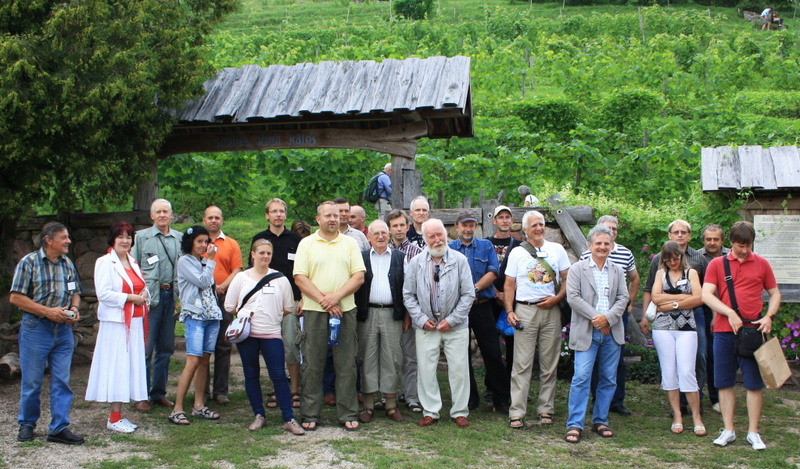 We visited a table grape producer Meelis Värnik, Pruuli-Kaska grape-farm, where a new vineyard grows on a slope of a hill. 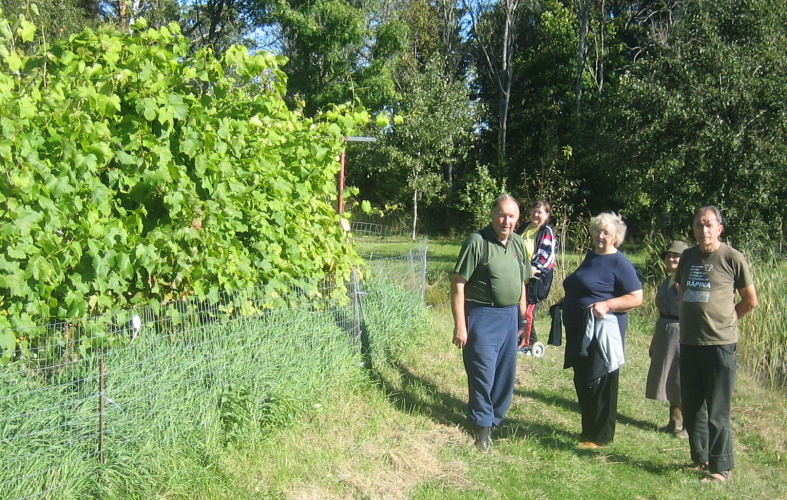 We saw a new vineyard in the village of Kääpa. 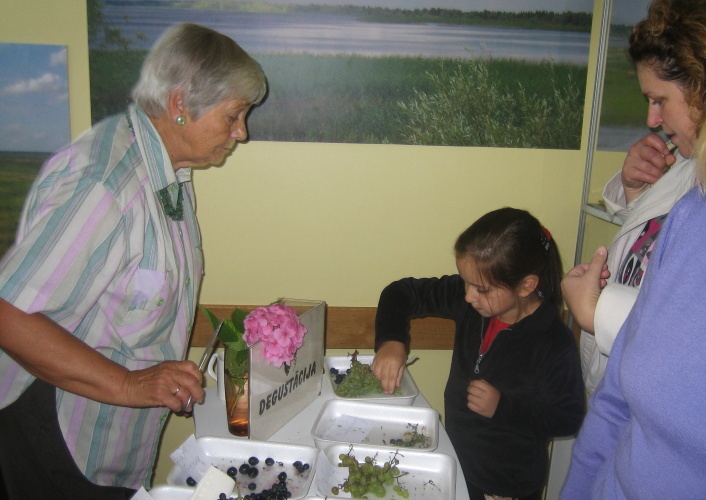 12.-14.09.2013 - The Latvian grape exhibition took place in the Museum of Nature in Riga, Krisjana Barona street 4. 25.-30.08.2013 - A trip to the vineyards of Western Estonia. 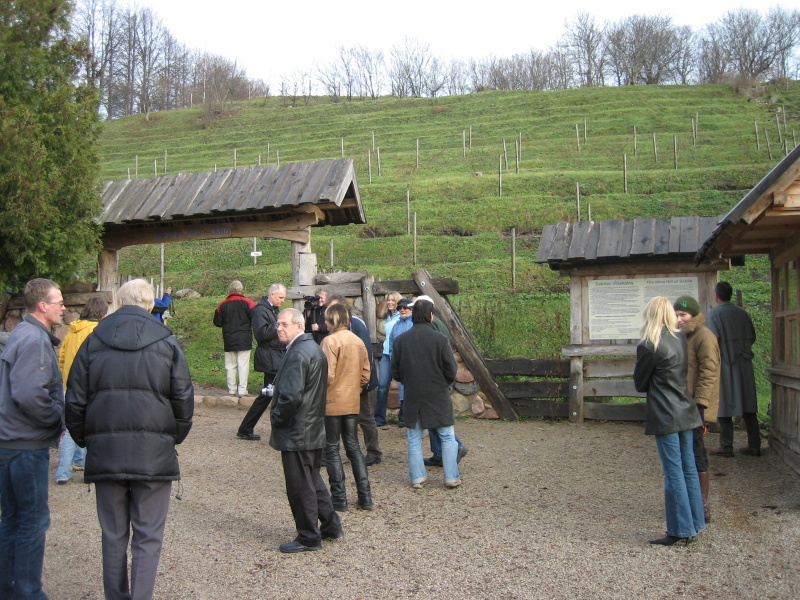 27.12.2012 - An article arrived from a Czech magazine in which Martin Kristek described his visit to Estonian vineyards. 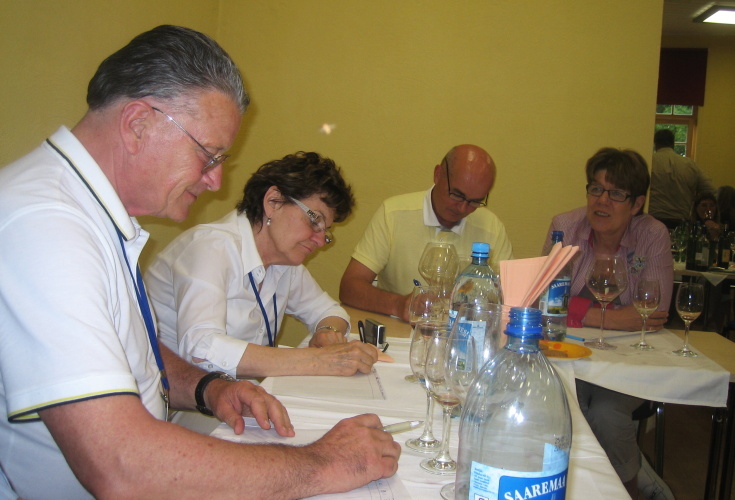 An international wine congress was held in Tartu 6-8 July 2012. 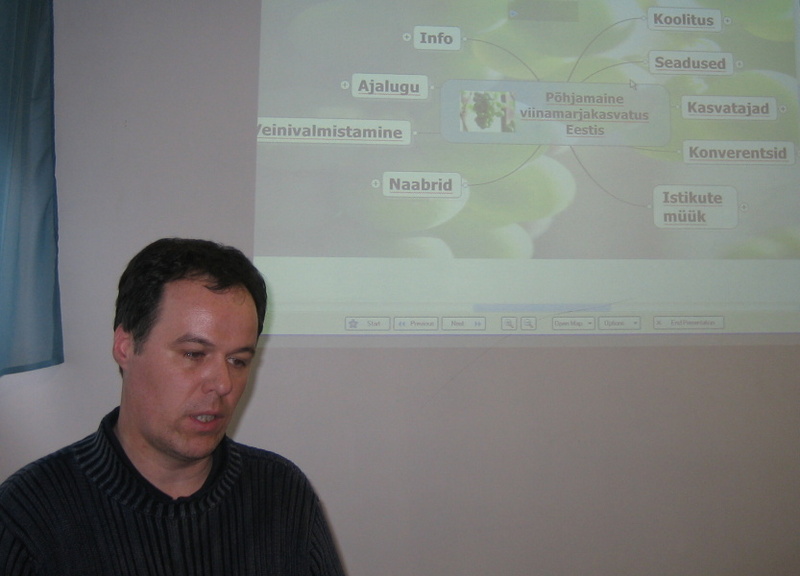 One day before 05.07.2012 Tea and Jaanus Lajal organized a conference entitled Grape and wine production in Northern Europe. 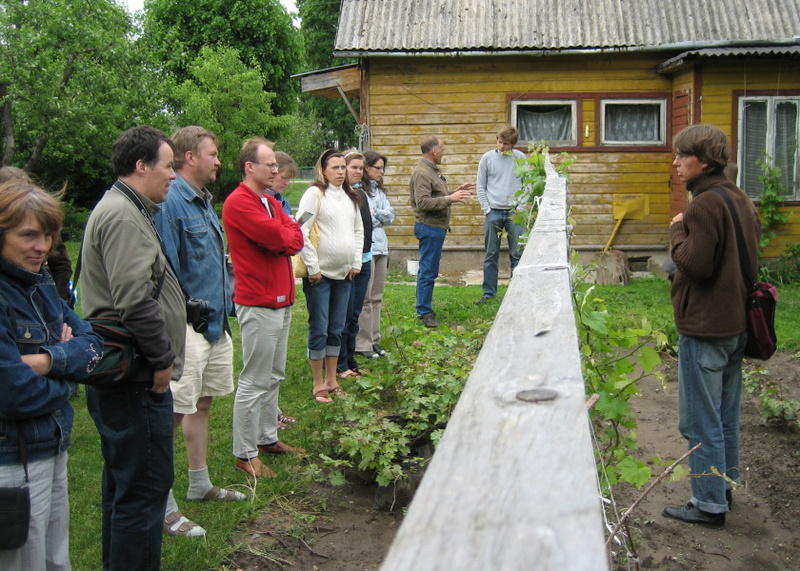 Guests visited the experimental vineyard at Rõhu. 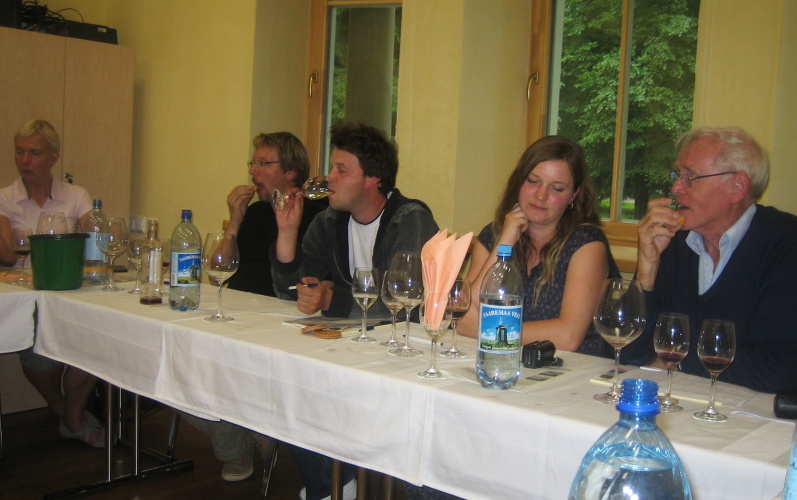 They tasted Estonian wines and fruit wines. Experts from Italy and Finland, Portugal, England and others participated. 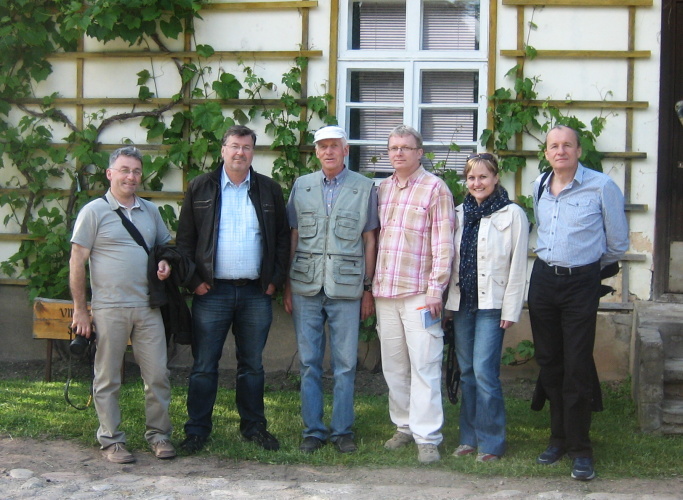 07.06 - Wojciech Bosak, a wine journalist from Poland and 4 his colleagues from the Czech Republic visited Räpina. Mr. Bosak writes for magazines Magazyn Wino and Czas Wina. 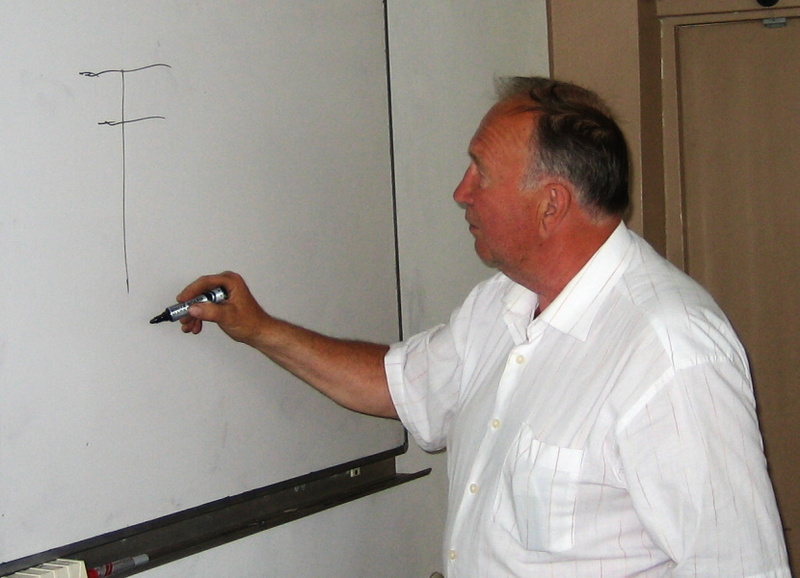 He administers the website Winologia. 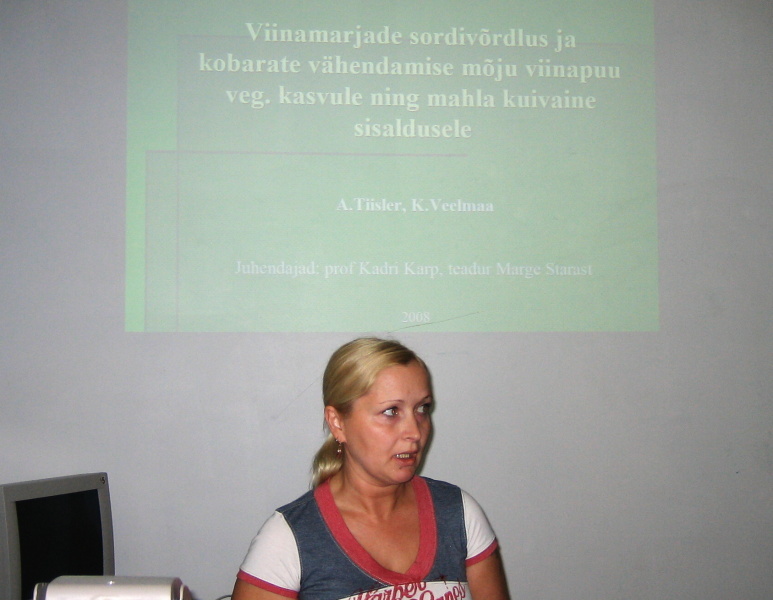 26.04 - A new book "Maalehe viinamarjaraamat" about Estonian grapes was published by the publishing house Hea Lugu. 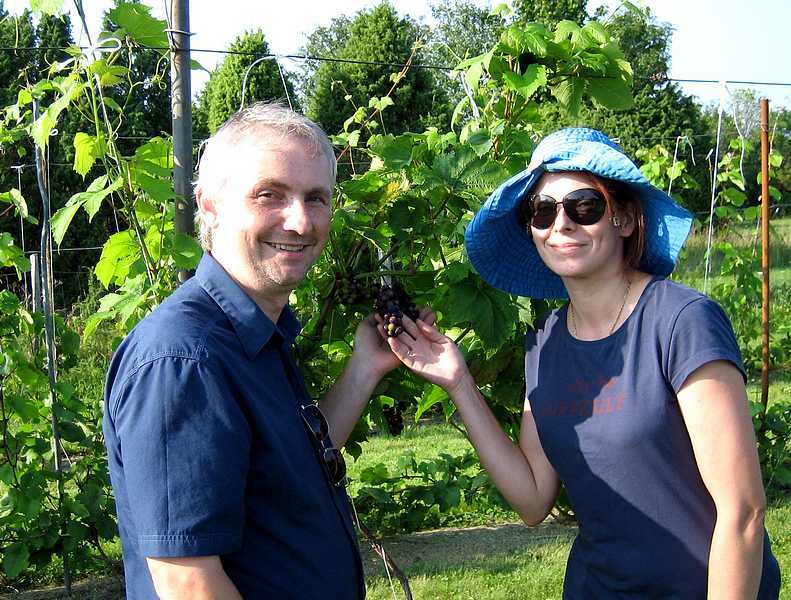 26.12 Erik Waaler sent a photo taken by the gate of Sabile vineyard on 30.07.2011. 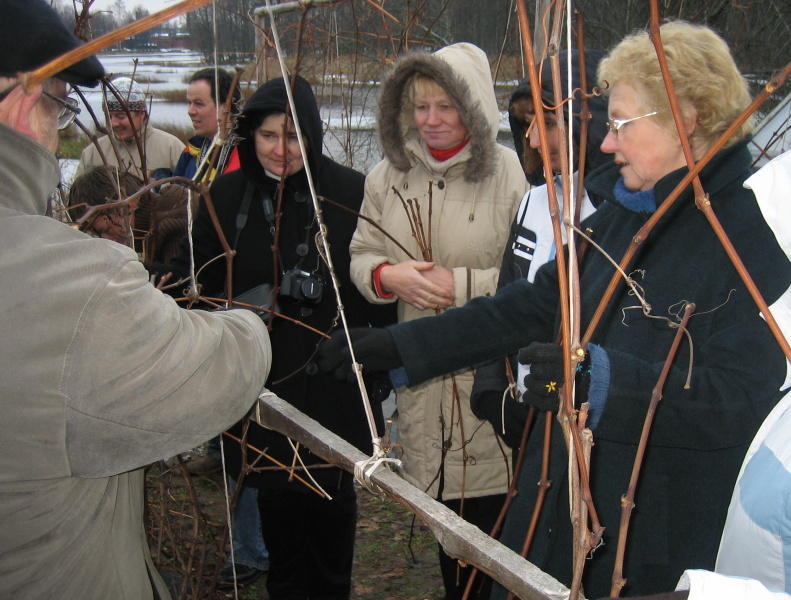 08.12 - The annual meeting of grape and wine lovers in Tartu. Martins Barkans from Latvia partcipated. 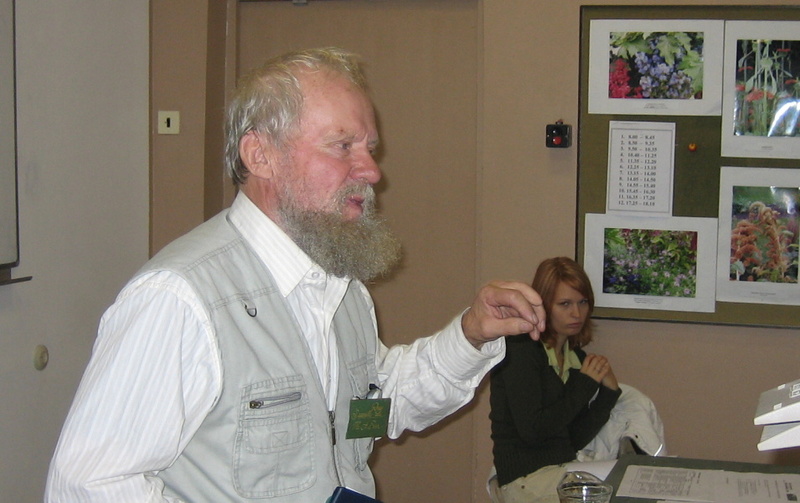 Priit Pedastsaar, who explores the grape suitability for wine made speech there. 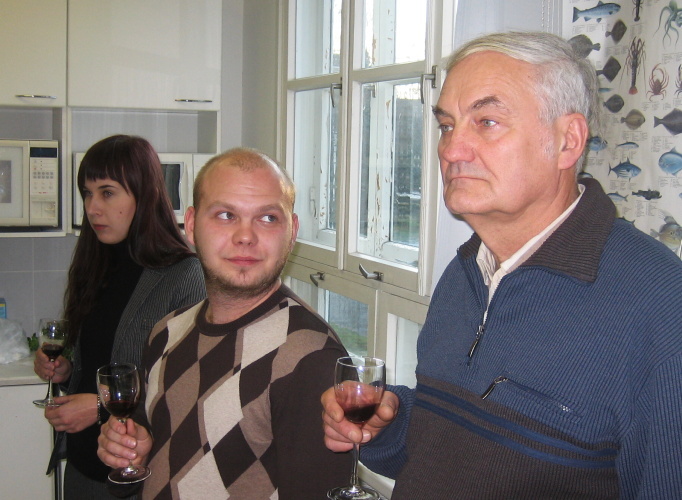 There are Priit and his adviser Tõnu Püssa on the photo. 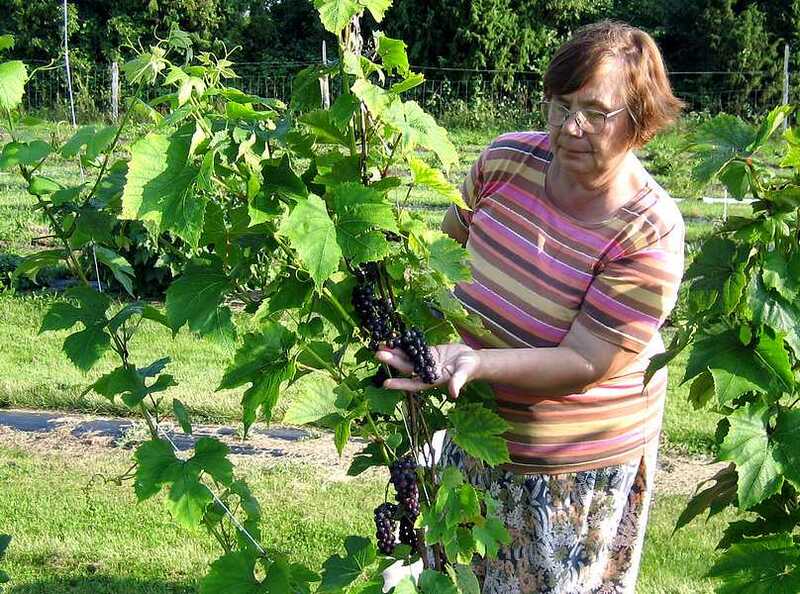 25.09 - ESTONIAN GRAPES ON SALE. 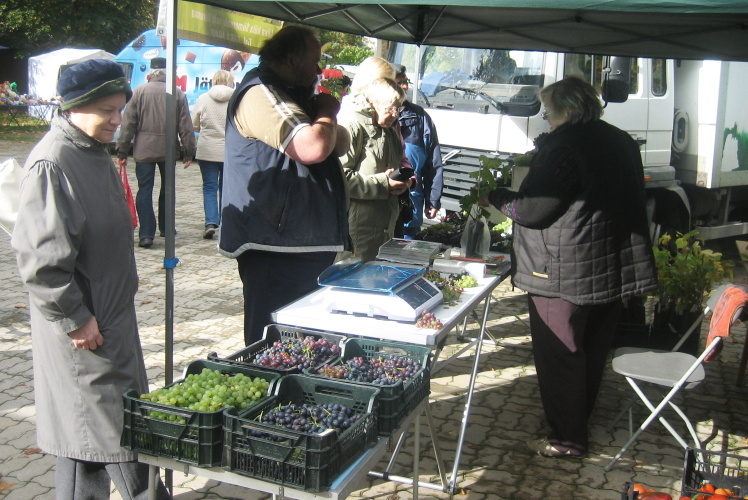 Pruuli-Kaska farm sold grapes on the fair at Räpina 4.50 euros per kilo. 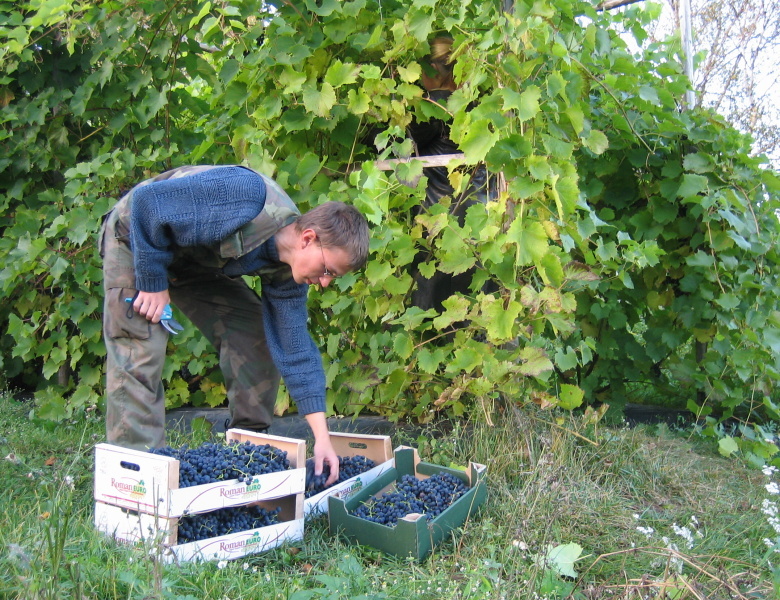 Estonian grapes are sold in shops in Võru and Tartu. 14.09 - Olga Tshikina and her husband from Moscow visited us. 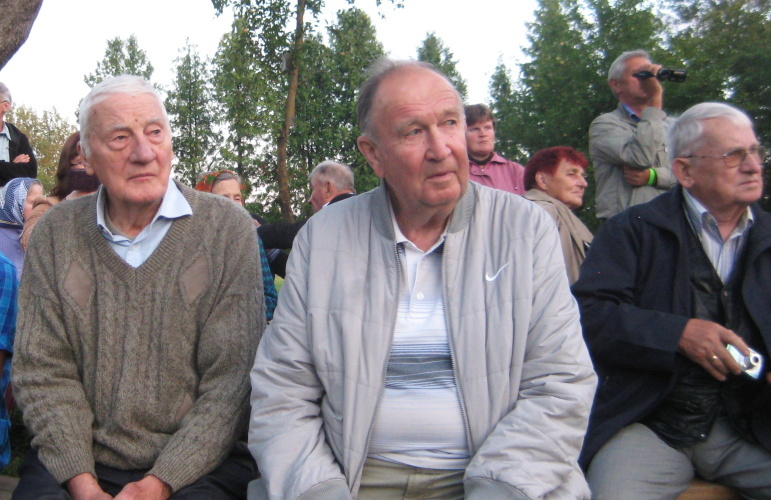 There are Evalds Pilka and Girts Mikelsons from Latvia on the photo, too. Girts measured sugar in the grapes. 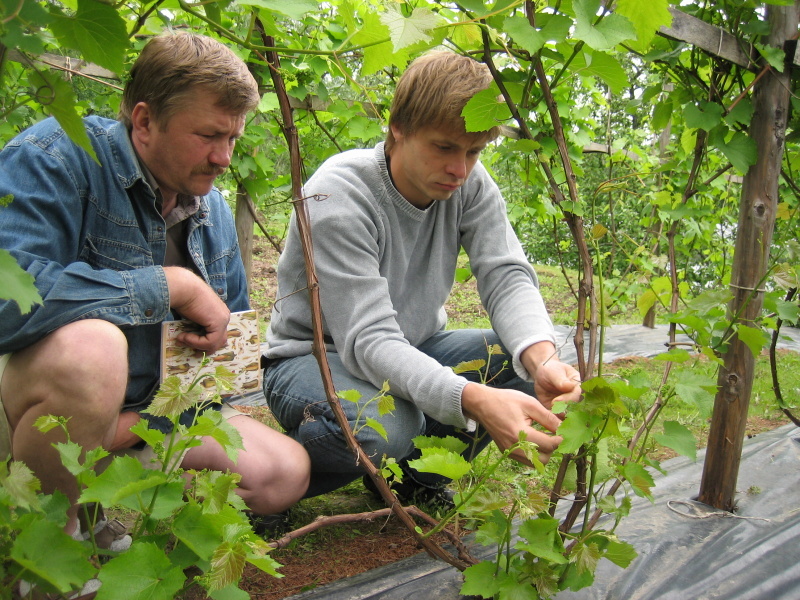 10.09 - Jaanus and Tea Lajal measured sugar in the grapes in my vineyard. 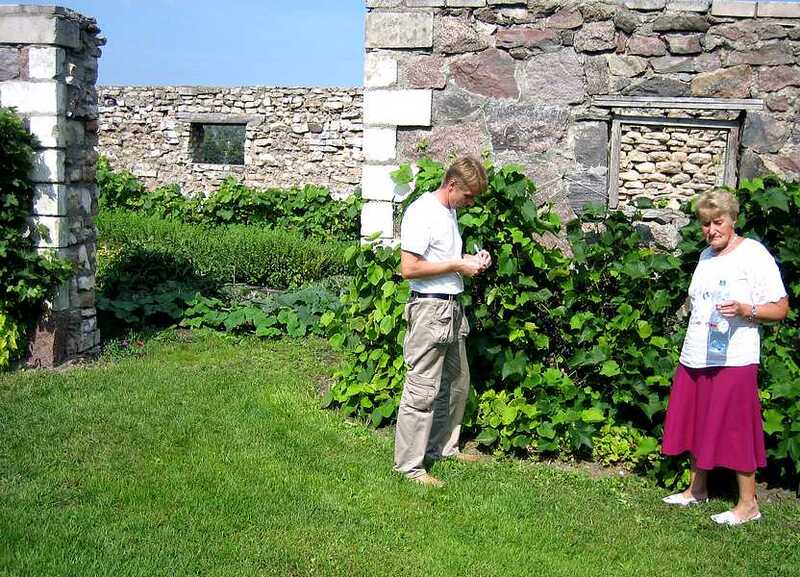 28-31.07 - Baltic Scandinavian Grape Conference at Sabile. 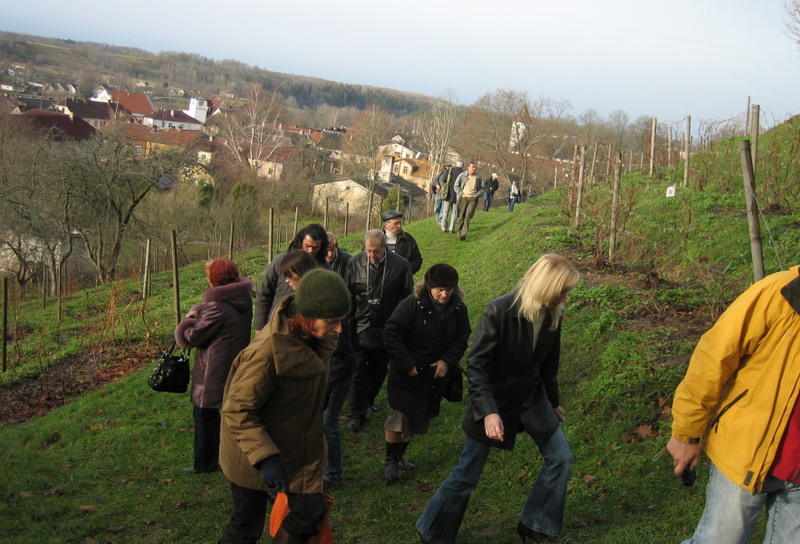 Some participants near Sabile vineyard. The photo has taken by Erik Waaler. 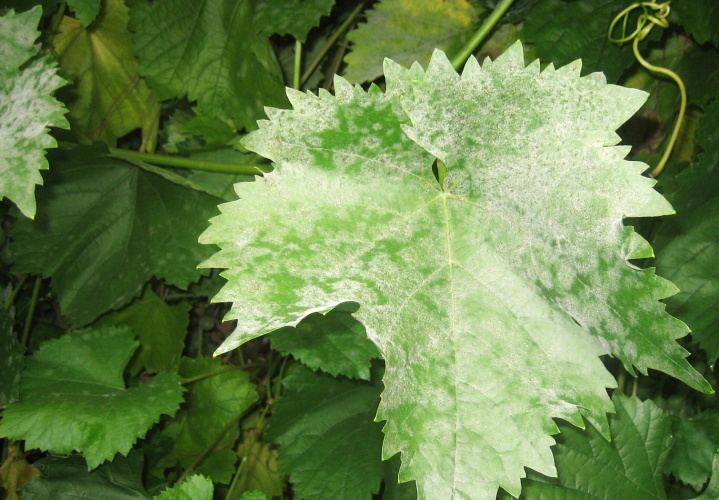 22.07 - We have got problems with powdery mildew (Oidium Tuckeri) in greenhouses and with downy mildew (Plasmopara viticola) out of doors this year again. 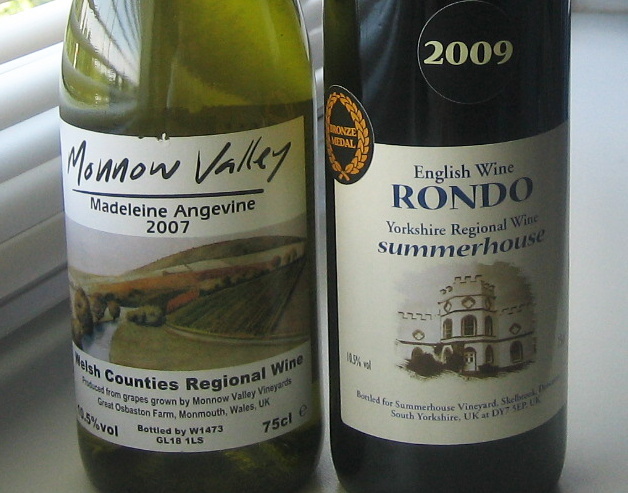 21.07 - Gwyn Davies (on the right) from UK brought a surprising present: an English wine Rondo and a Welsh wine of Madeleine Angevine. 20.07 - A trip about South-Estonia. 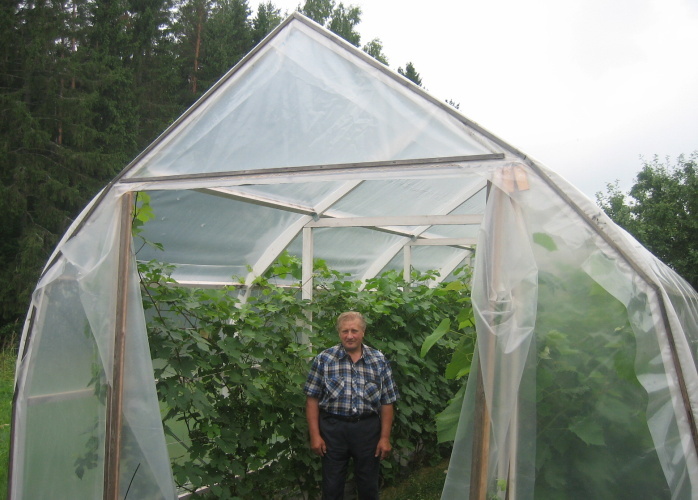 Meelis Värnik is hoping to get the first yield of table grapes this year from his greenhouses. Lija ja Jüri Kaska have restored their greenhouses which were broken by storm last year. 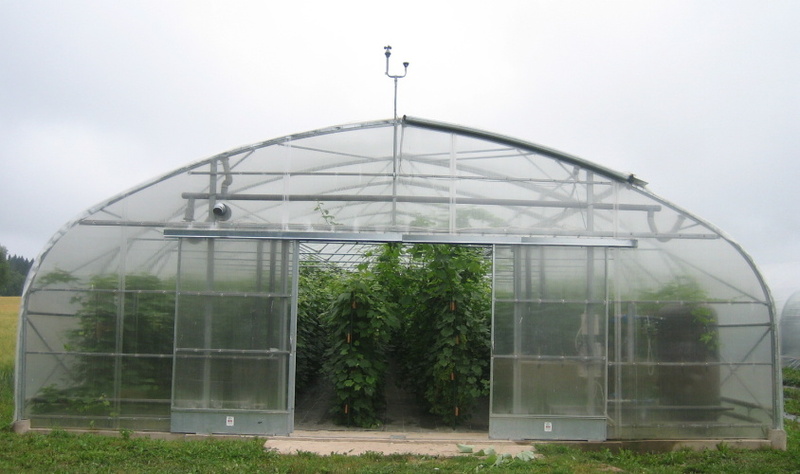 Hans Toover is a constructor of greenhouses suitable for grapes. 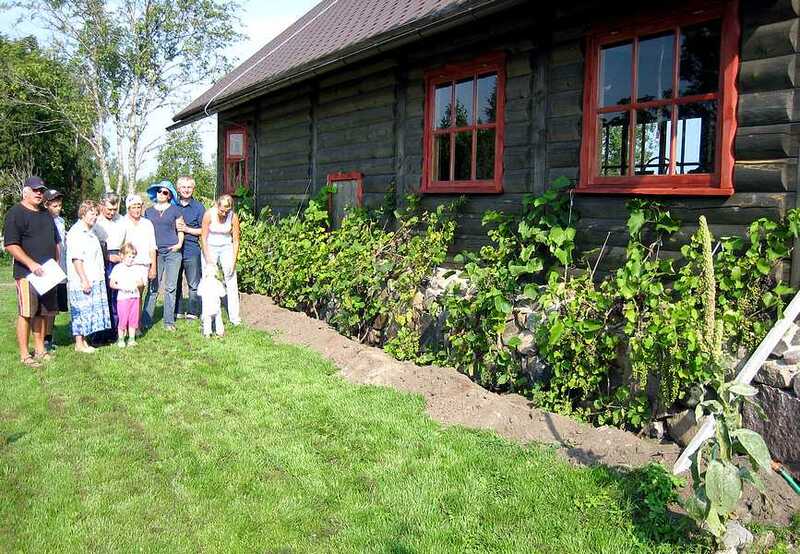 Jaak Eensalu has planted new rows of 'Solaris' into his vineyard. 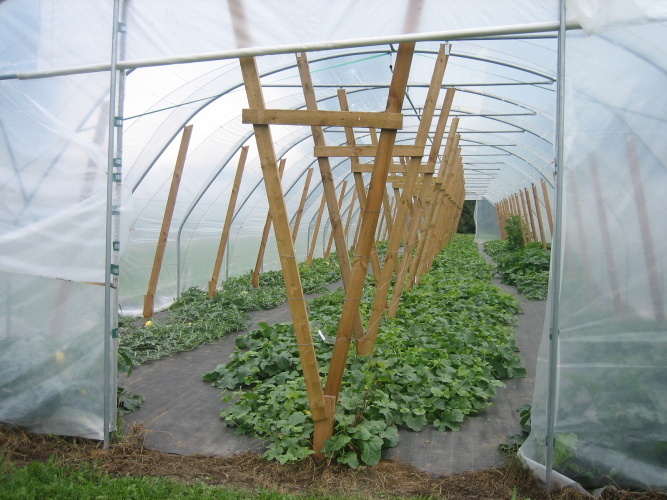 Harri Poom has got new greenhouses to produce table grapes, melons and water-melons. 30.04.11 - On the Estonian Television "Mina elan siin". 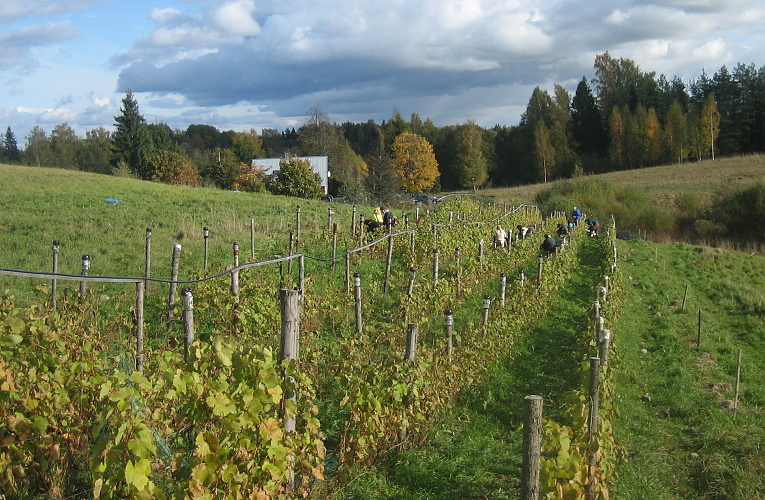 It starts with views of Räpina and grape growing here. 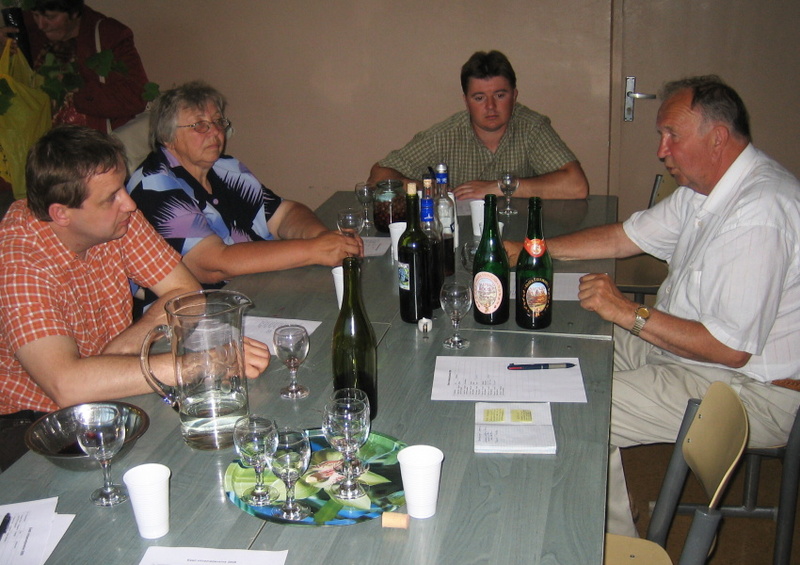 24.03.11 - The newspaper Maaleht informs about the 1st round of homemade wine competition. Two grape wines reached to finale. 24.03.11 - A TV talkshow. 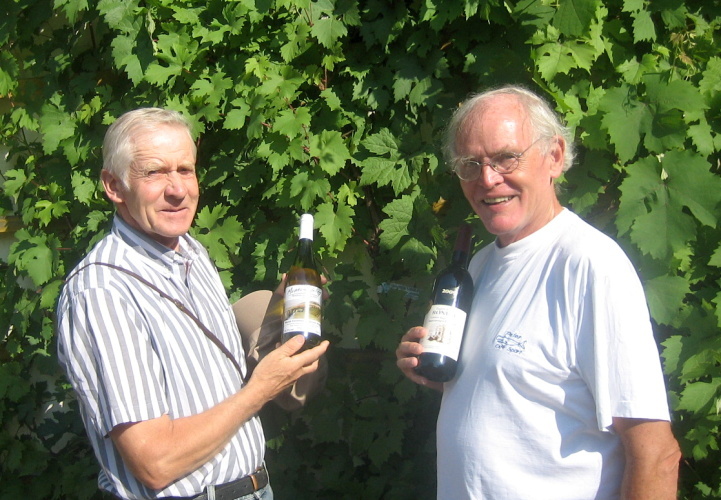 The wine expert Arne Pajula appreciates Rondo wine made by Jaak Eensalu in 2009. 18-19.03.11 - Ari Markkula and Timo Taskinen stayed at Räpina during their tour to Estonia and Latvia. 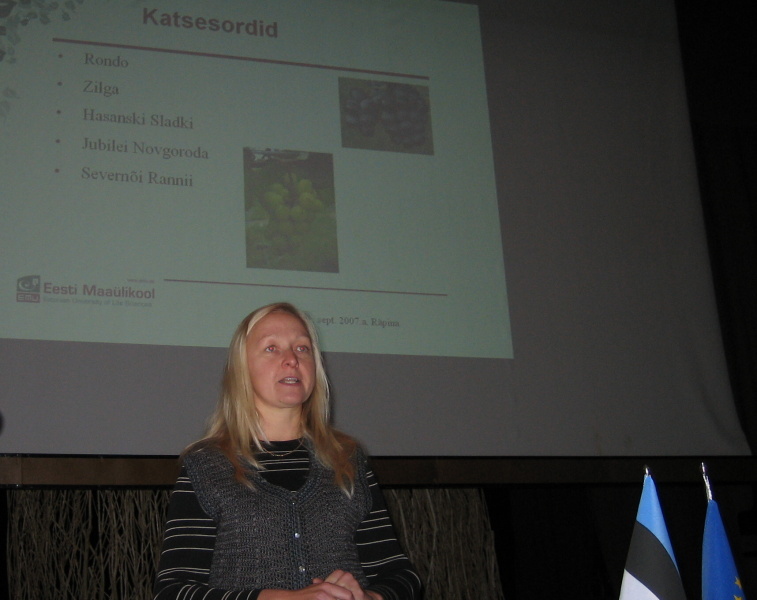 26.11.2010 A meeting of Estonian grape growers organized by Kadri Karp took place in Tartu. 06.11.2010 Suomen Viinikasvattajat RY arranged grape growing course at Tuorla in Finland. 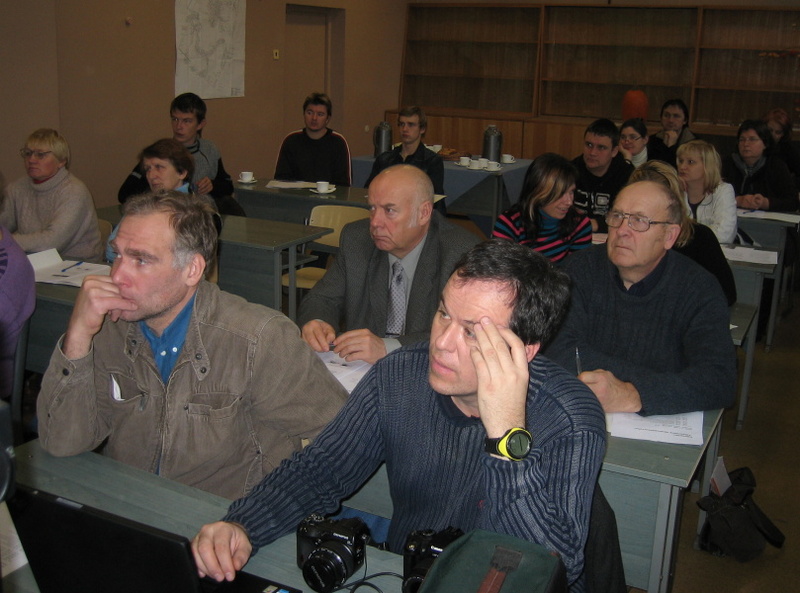 Raimo Saar and Andrij Rudyk from Pärnu participated in the course. 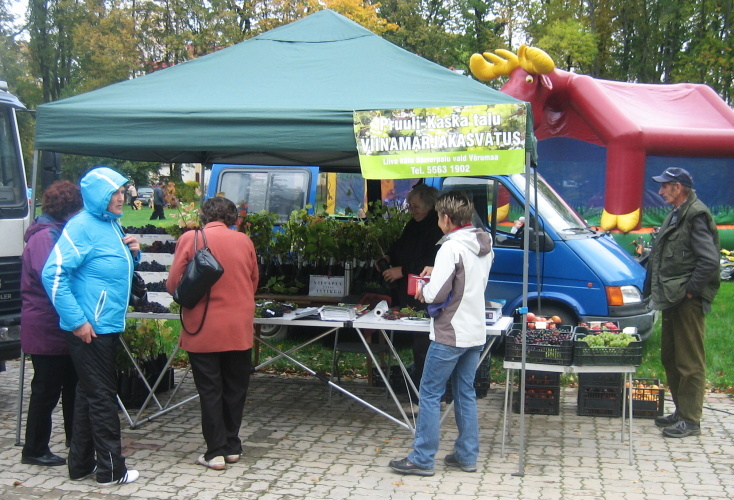 11.09 A training day took place in Pärnu. Raimo Saar, Harri Poom, Lija Kaska and Edgars Zihmanis arranged it. 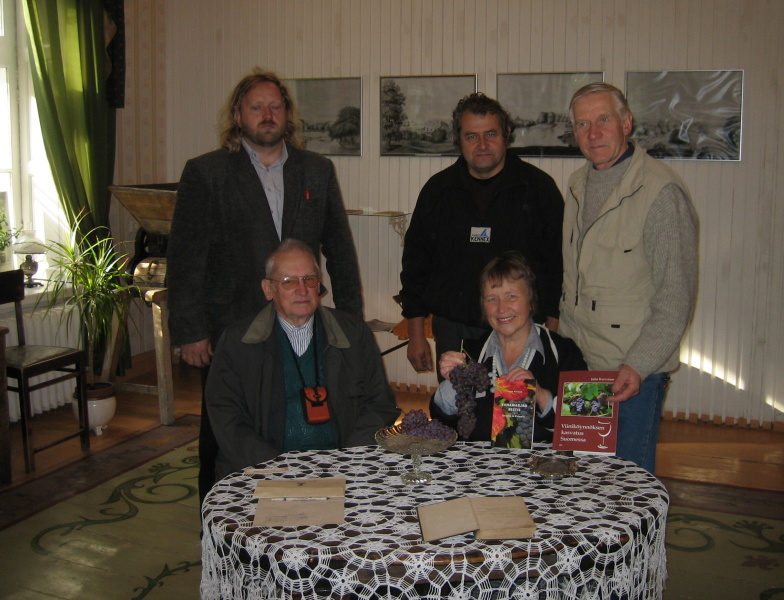 10.10.2010 An exibition about grapes in Estonia has been opened in Estonian Agricultural Museum in Tartu. 27.08 The next training day occured at Räpina. Jaak Eensalu, Harri Poom, Lija Kaska Jaan Kivistik and others made speeches there. Berries have started ripening out of doors on 1st week of August. It happen this year for the greater part of varieties at the same time. 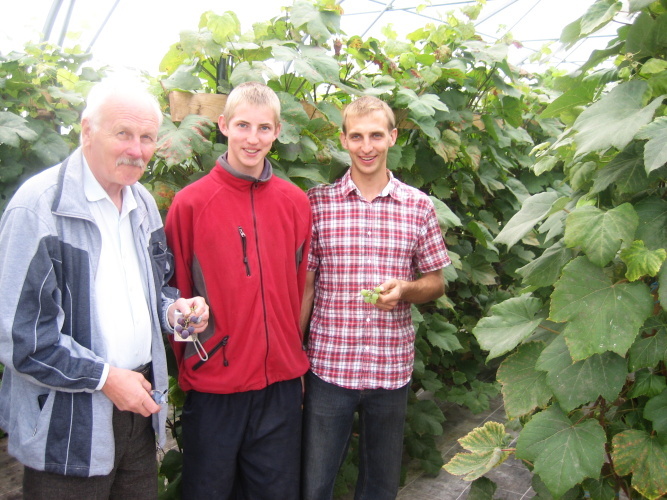 We ate first berries of 'Somerset Seedless' from greenhouse on the 1st August. 25.08. 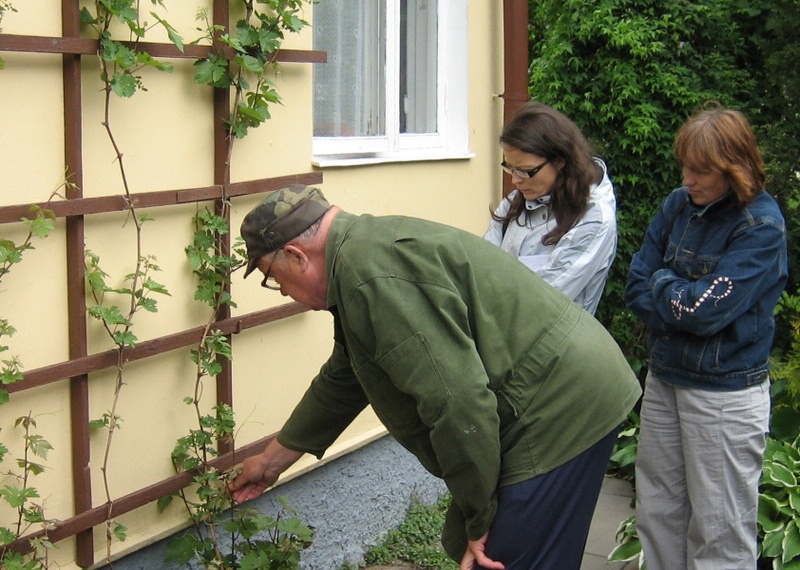 We eat berries of 'Kuzminski Sinii', 'Hasanski Sladki', Kosmonavt' and 'Madeleine Angevine' which have picked out of doors. 25.08. 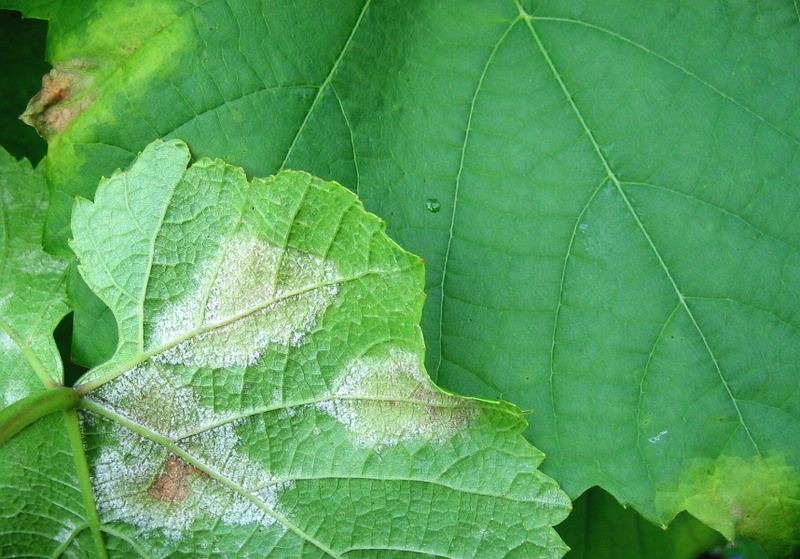 I observed downy mildew (Plasmopara viticola) on leaves of Vitis amurensis at verdure of school. 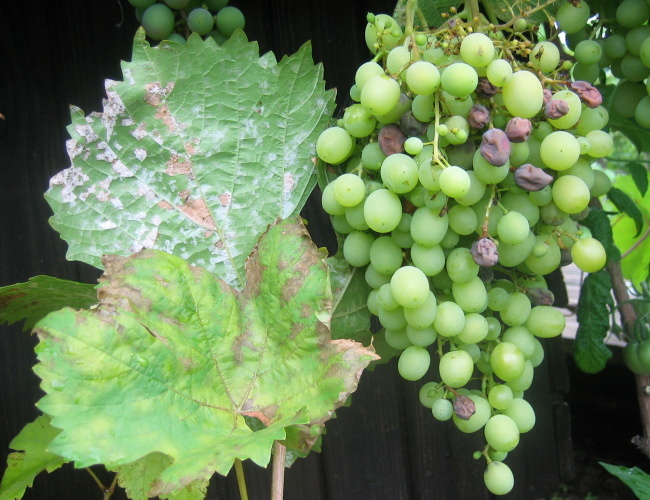 Jaak Eensalu has complained about damage of downy mildew (Plasmopara viticola) in his vineyard. frozen (minimum temperature -33 C) - 'Aljoshenkin', 'Kosmonavt', 'Supaga', 'Blaue Burgunder', 'Marechal Joffre', 'Price', 'Vamuska'. 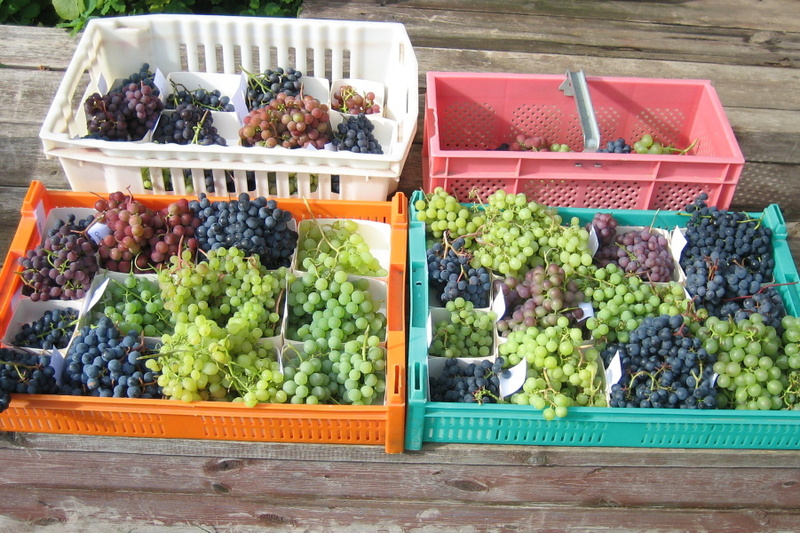 very well - hybrid cultivars 'Krassavets', 'Adalmiina', 'Jokke', 'Somerset Seedless', 'Swenson White' and V. vinifera 'Madeleine Royal L' from Latvia. 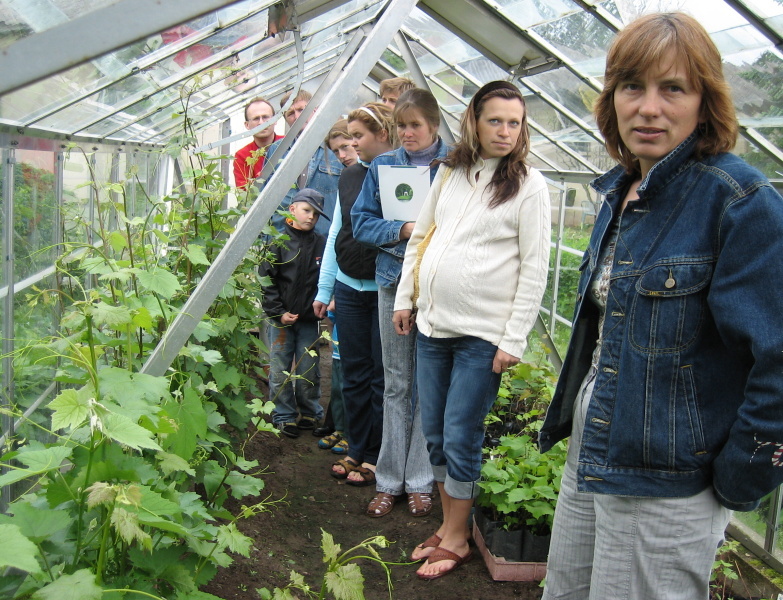 in unheated greenhouses - 'Aljoshenkin', 'Supaga', 'Krassavets', 'Kosmonavt', 'Swenson Red'. 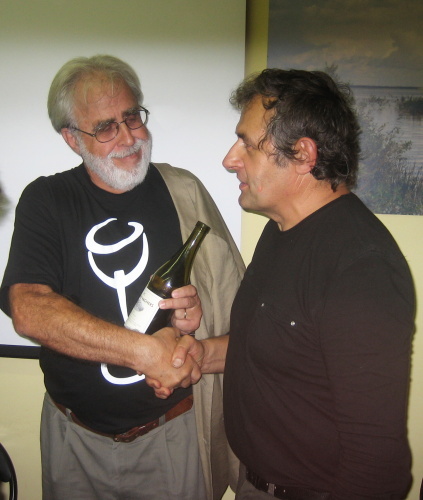 The 2nd International Conference on Northern Viticulture, Viti Nord 2009, held in Saint-Hyacinthe, Quebec, Canada. 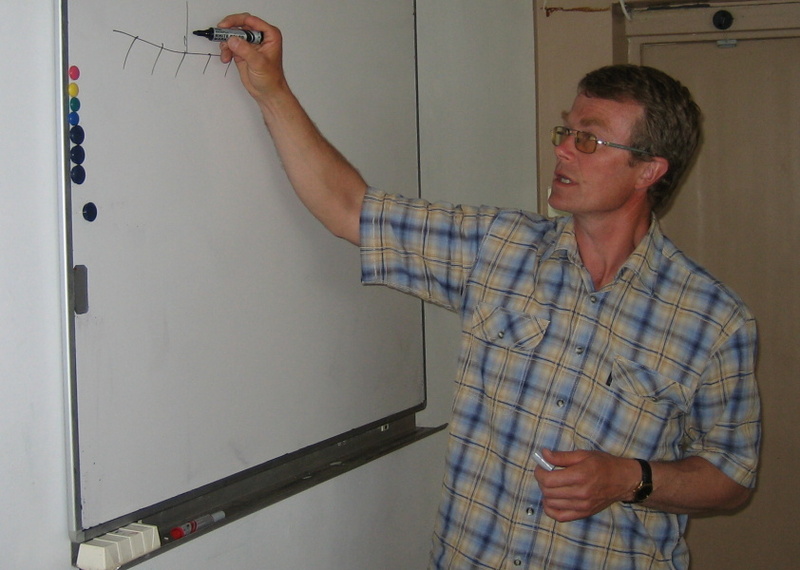 Harri Poom from Estonia participated in the conference. 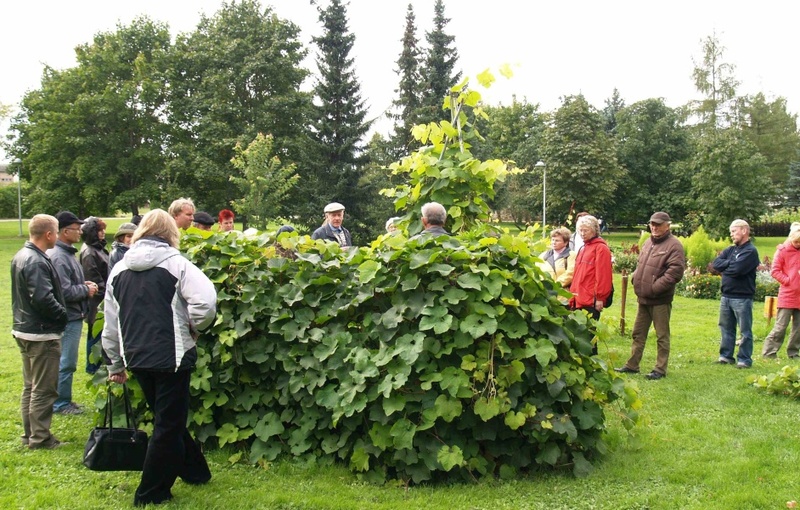 The 1st training day „Grape growing in Finland“ occured at Viurila manor. 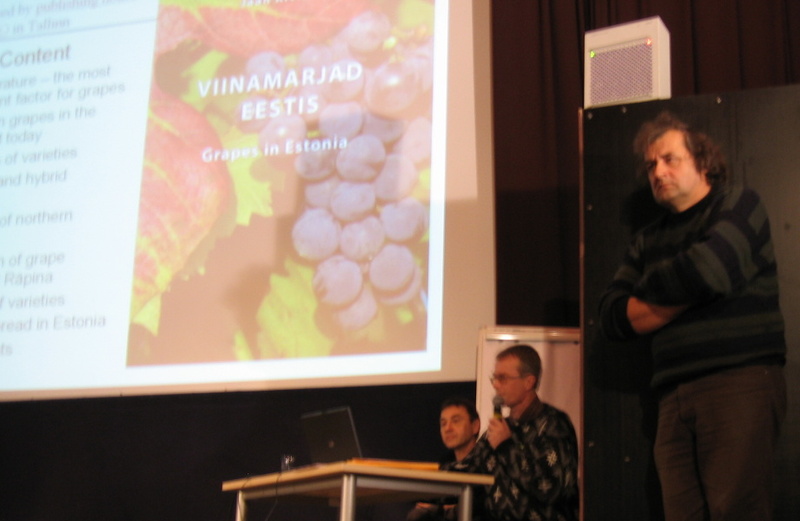 Raimo Saar and Jaan Kivistik from Estonia and Edgars Zihmanis from Latvia made speeches there about grape growing in their countries. 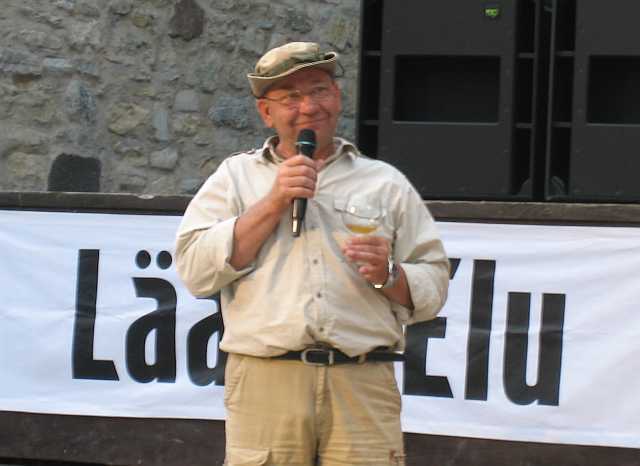 Juha Karvonen introduced his white grape wine Aino there. This wine is allowed to sell in Finland. 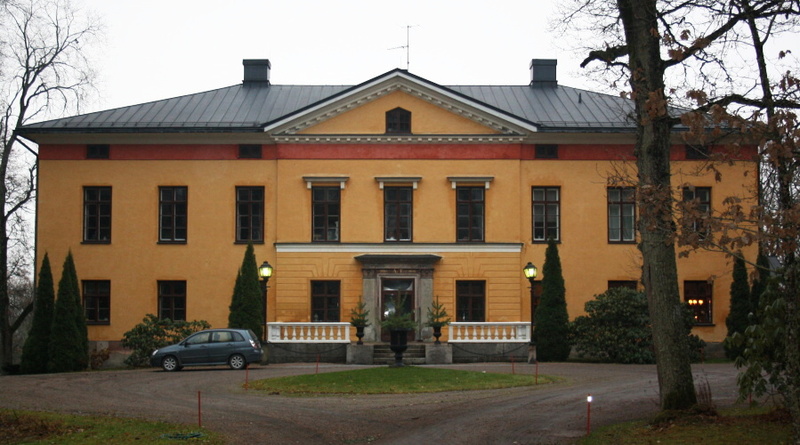 The manor house of Viurila. 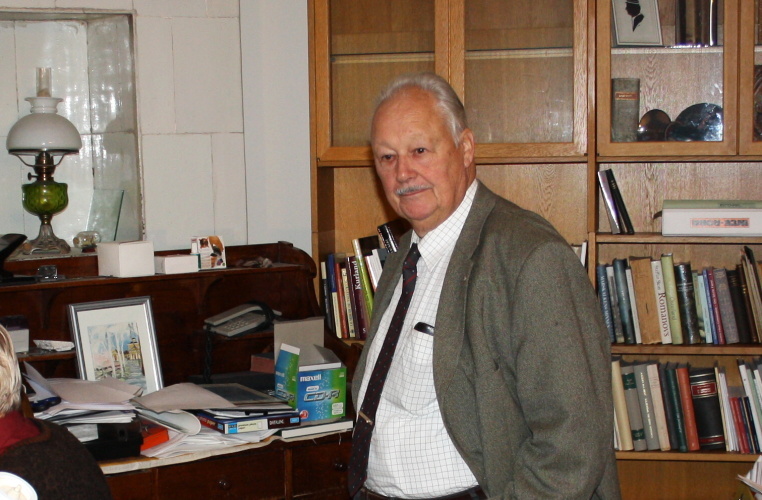 The landlord Günther Brüninghaus in his room. Readers Juha Karvonen, Günther Brüninghaus, Ari Markkula, Mariusz Swietalski, Edgars Zihmanis and Jaan Kivistik. There are Juha's books and his wine Aino on the table. 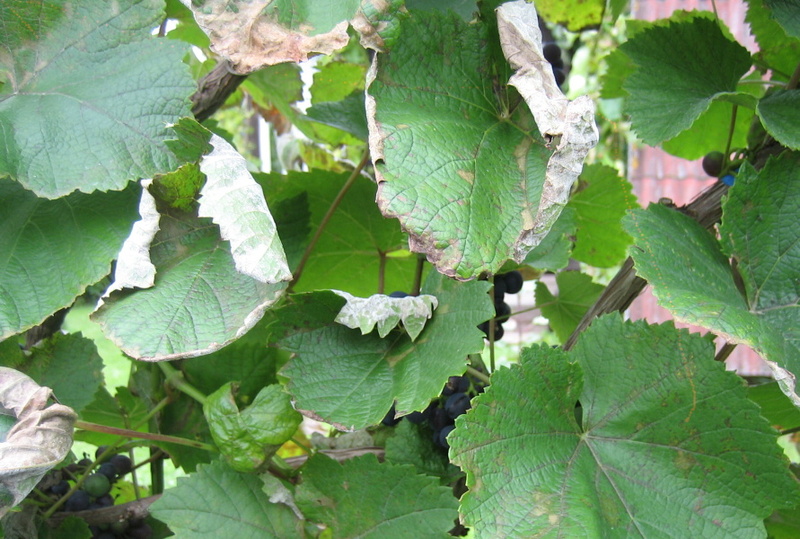 The first strong night frost ruined foliage of grapes at Räpina. 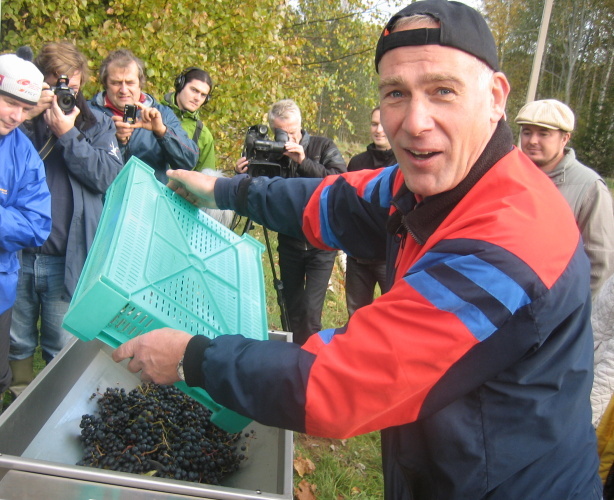 Jaak Eensalu arranged winemaking bee in his Annemäe farm. Andris Dishlers and Marta Igaune have arrived from Latvia. You can see video of this day. 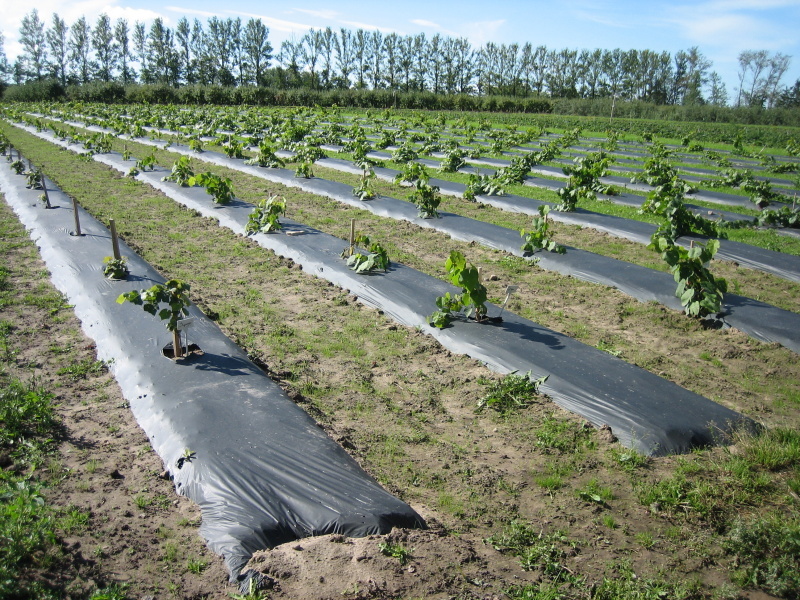 The first crop from plantation of 'Rondo' planted in 2006. 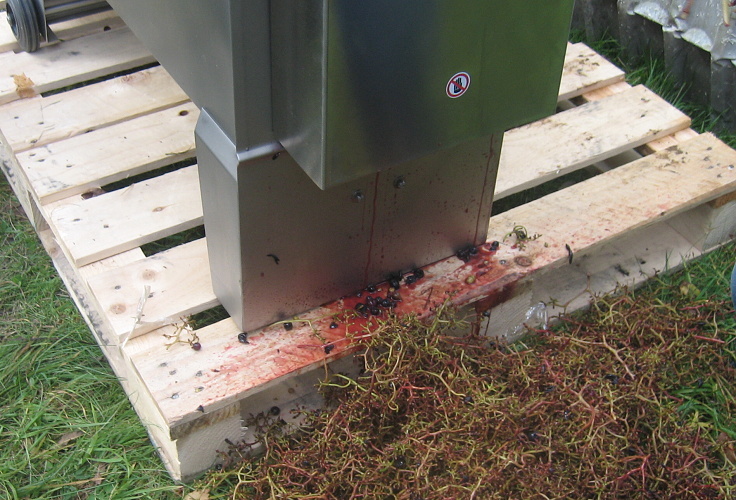 Jaak Eensalu put into practice his new wine equipment. Look for more information on Estonian page. A training day at Räpina. You can see photos on the Estonian page. 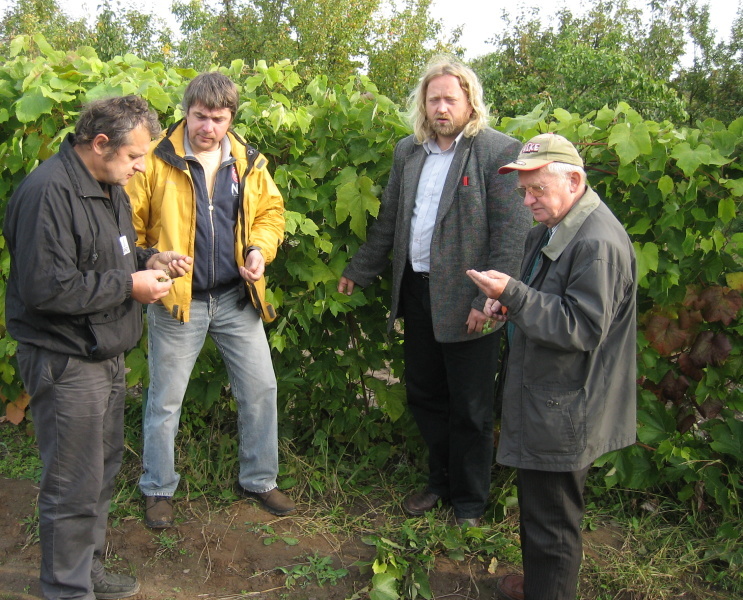 Jaan Kivistik - Grape in tourist farms; co-operation between tourist farms, grape growers and wine makers. 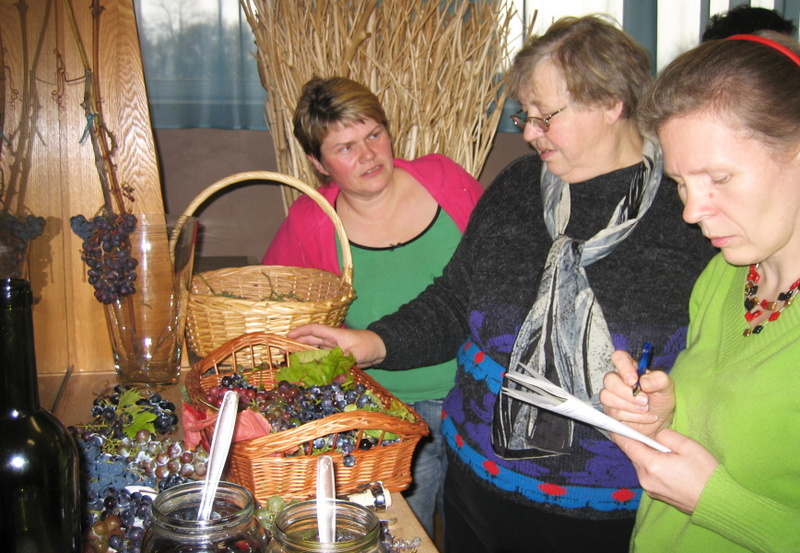 Jaak Eensalu, Liia Kaska, Felix Buschmann - Experience of grape growing. 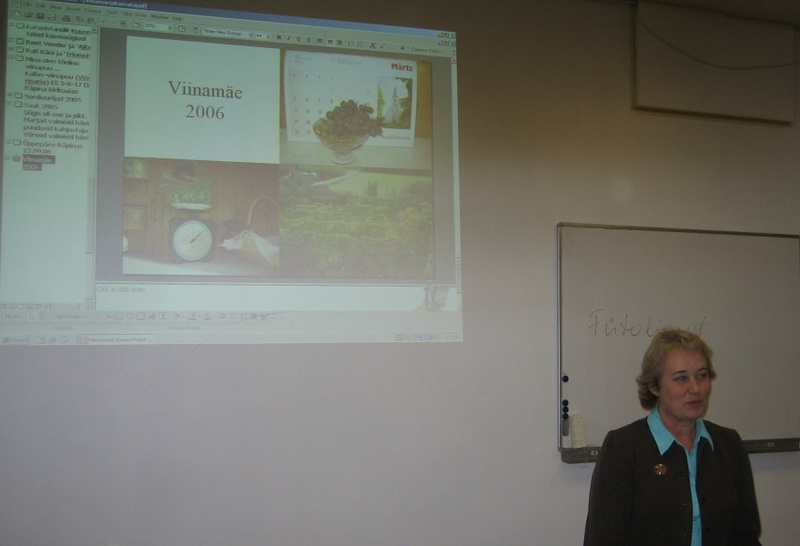 Marta Igaune - Wine making experience in Latvia. 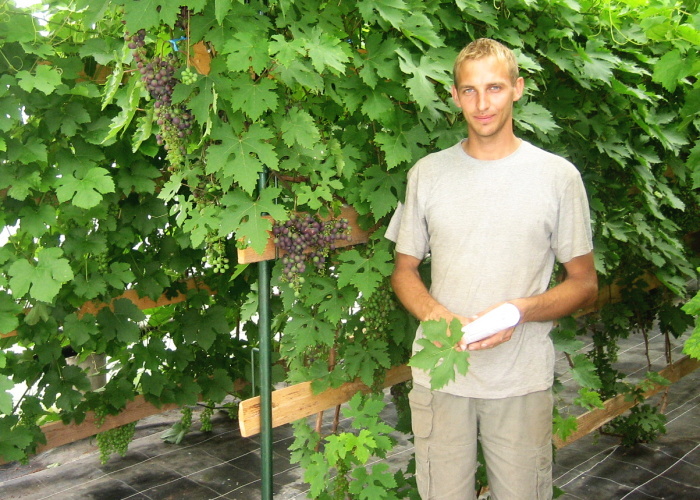 Andris Dishlers, Girts Mikelsons - Grape news in Latvia. 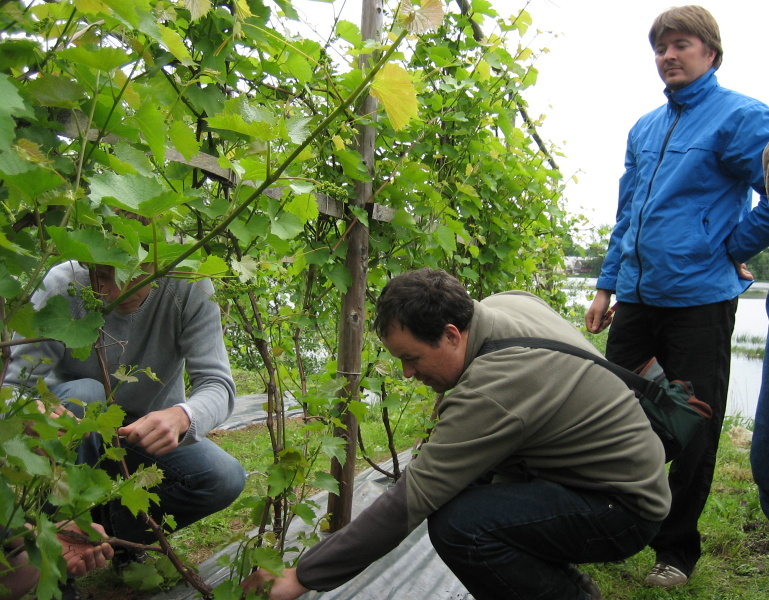 Practical works in the garden (comparing of species and varieties, picking grapes). 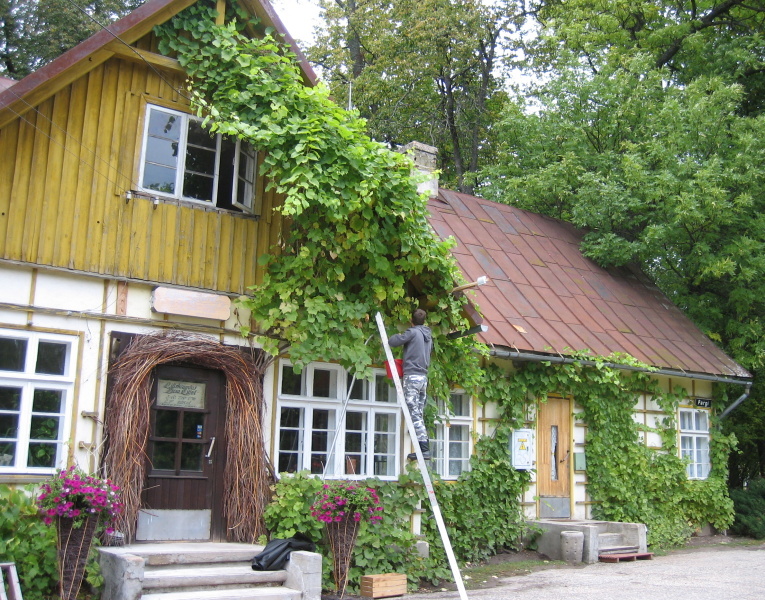 Jaak Eensalu writes in the wine magazine Vine about grape growing in Estonia. 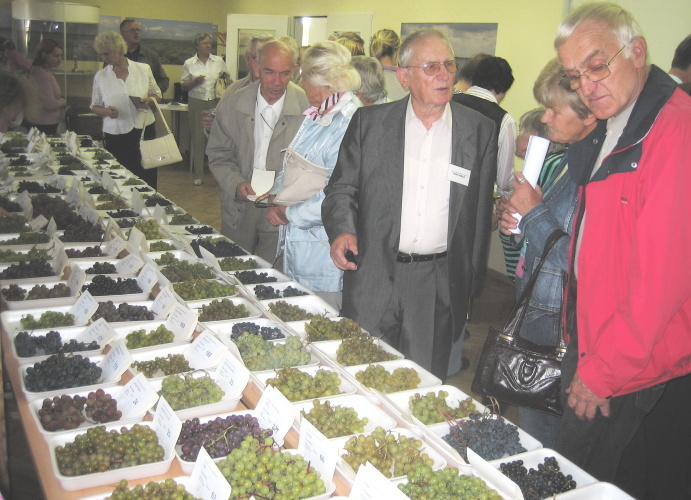 They visited the grape exhibition in Riga. You can see some photos taken on the exhibition: 1, 2, 3, 4, 5, 6, 7. 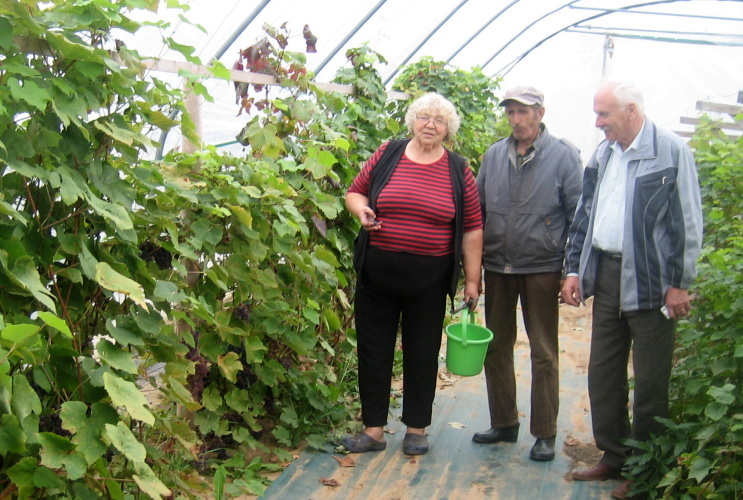 Visit to Edgars Zihmanis who grows grapes in greenhouses (800 m2) at Kronauces and to Gatis Kuzhums who has a big variety collection in his homegarden at Bauska. 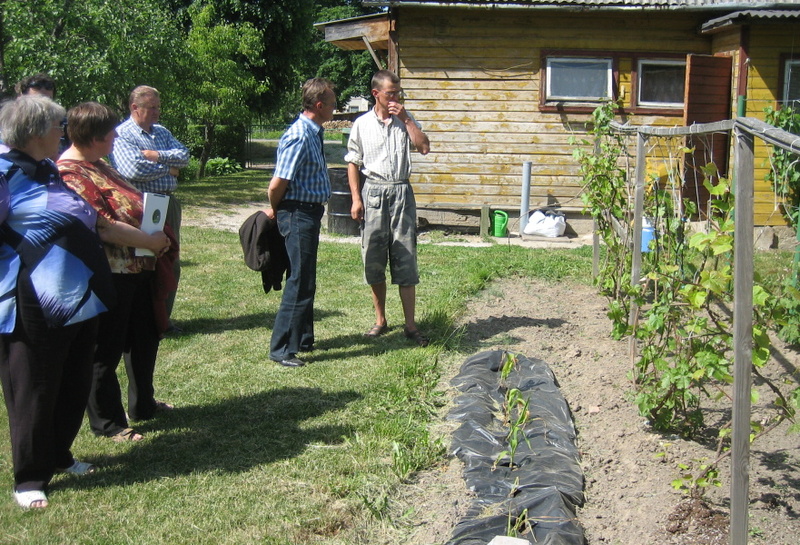 There is an experimental plantation close to Latvian and Estonian frontier at Ruusmäe. 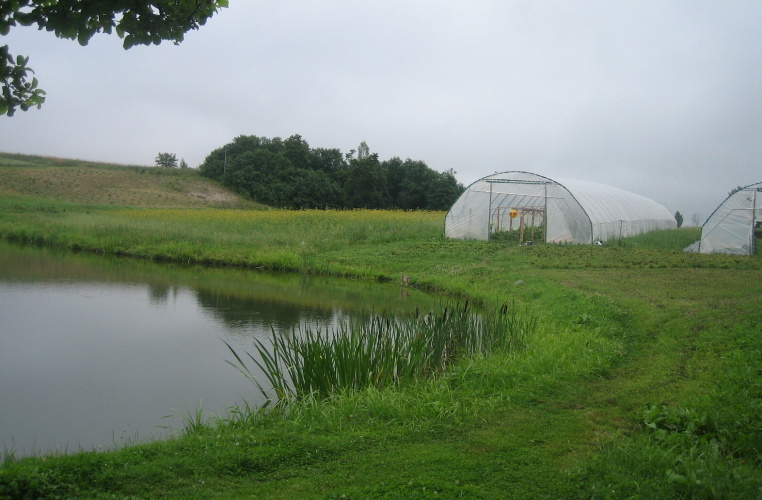 There are growing about 100 plants of 'Zilga', 'Hasanski Sladki', 'Jubilei Novgoroda', 'Rondo' and 'Severnõi Ranni'. 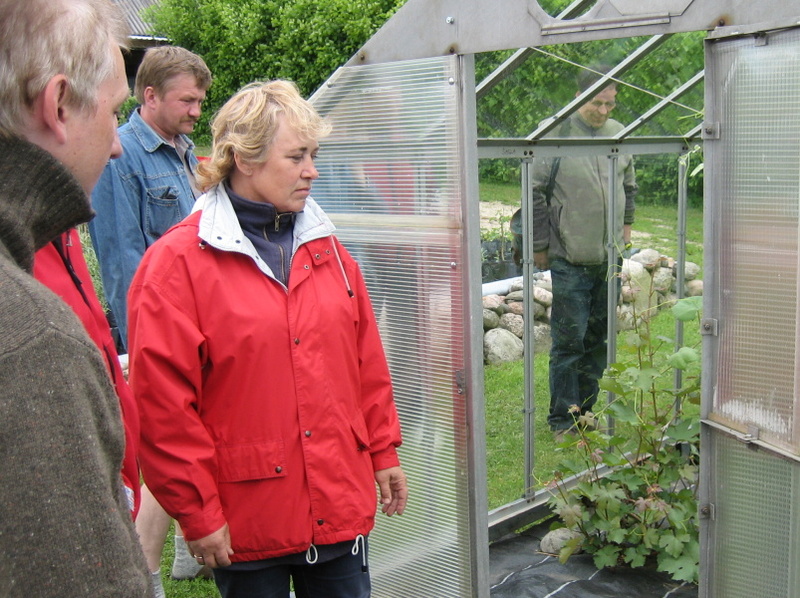 Rasima and Raimu Aas are growing over 140 varieties in their homegarden near Haapsalu. 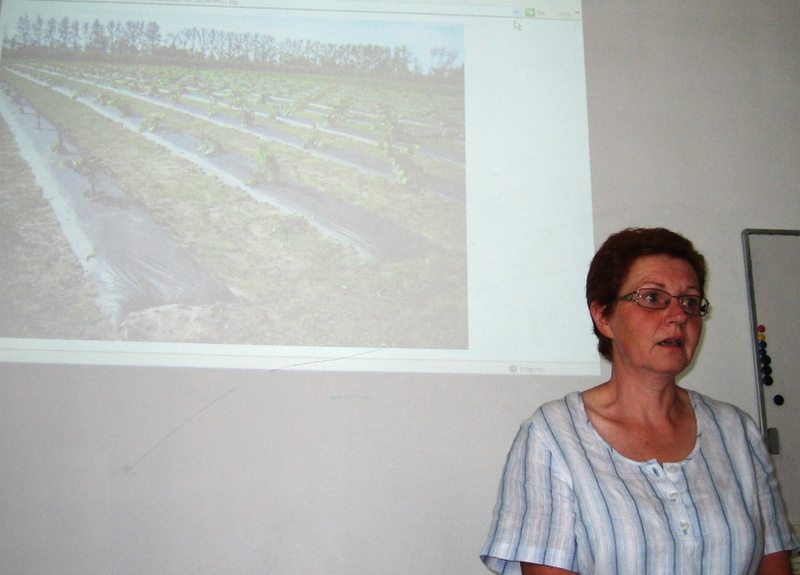 Liia Kaska presented grape varieties and her seedlings. 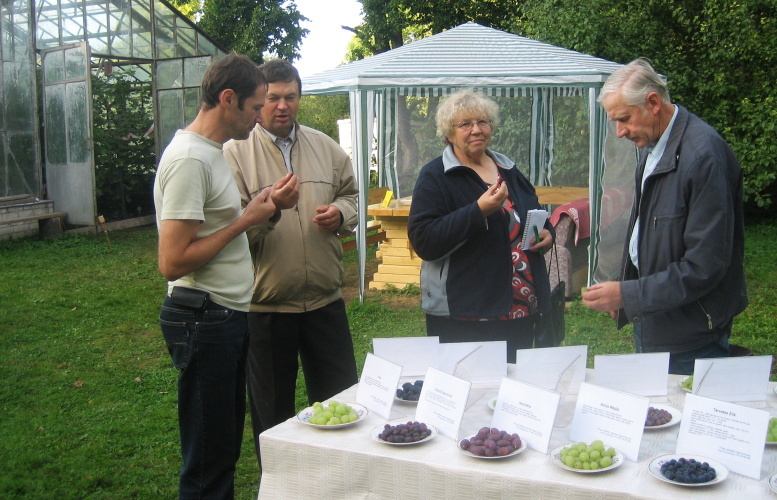 Visitors tested and evaluted grapes. 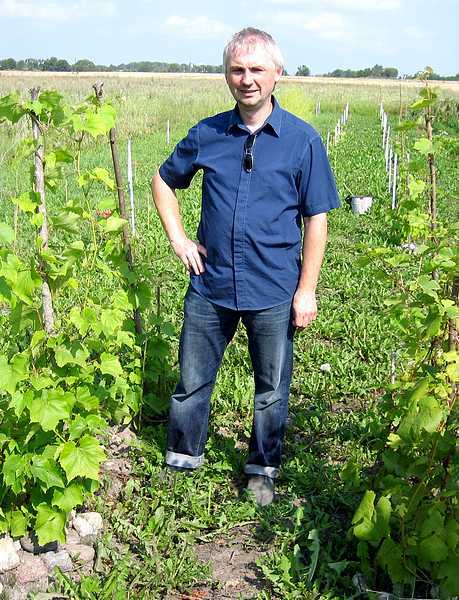 Mariusz Swietalski from Finland visited my vineyard. 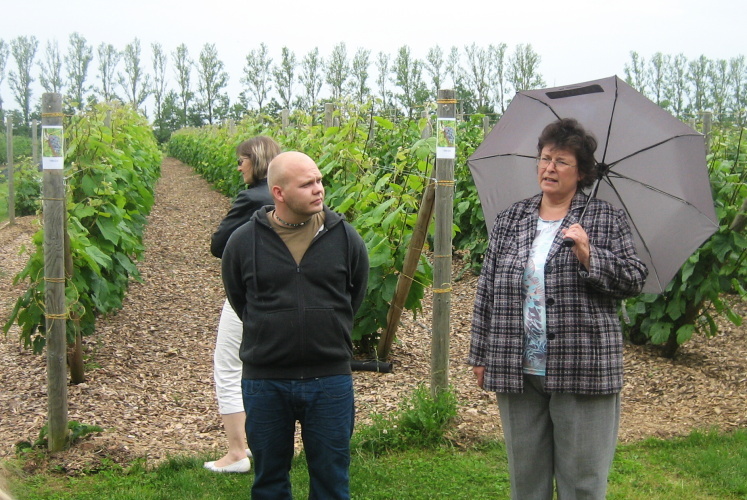 Visiting the vineyard of Jaak Eensalu and the vineyard of Liia Kaska. A training day at Räpina. 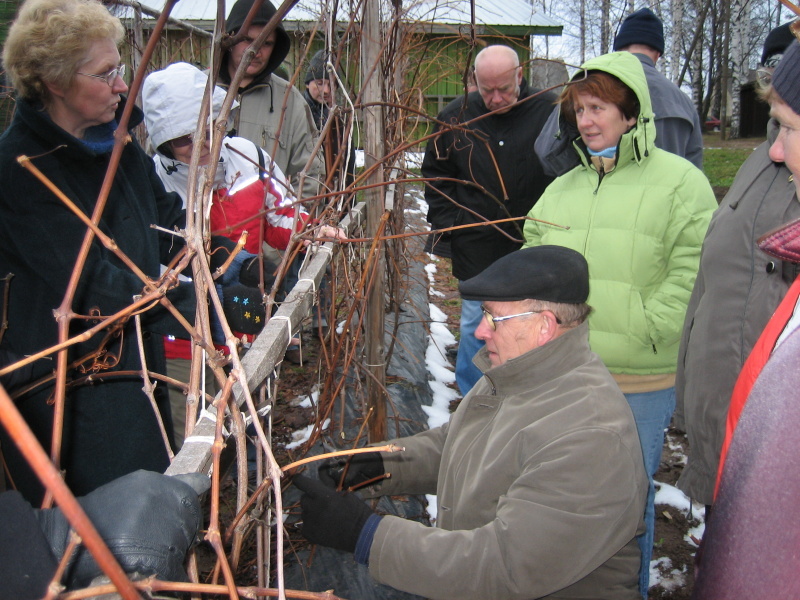 Planting and summer pruning of grapes. A training day at Viljandi. 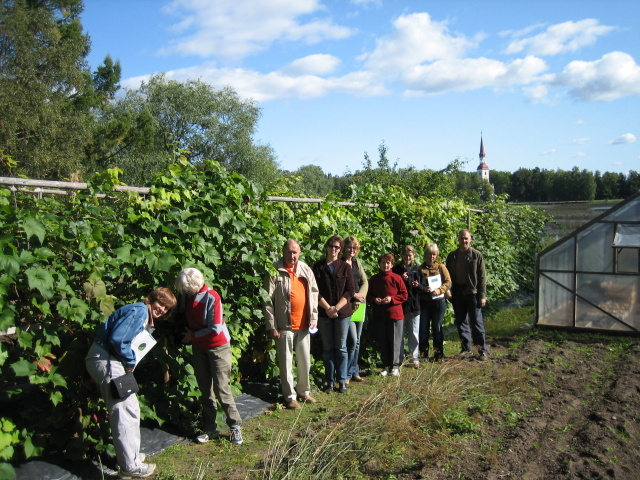 Participants in the garden of family Tõnumaa. 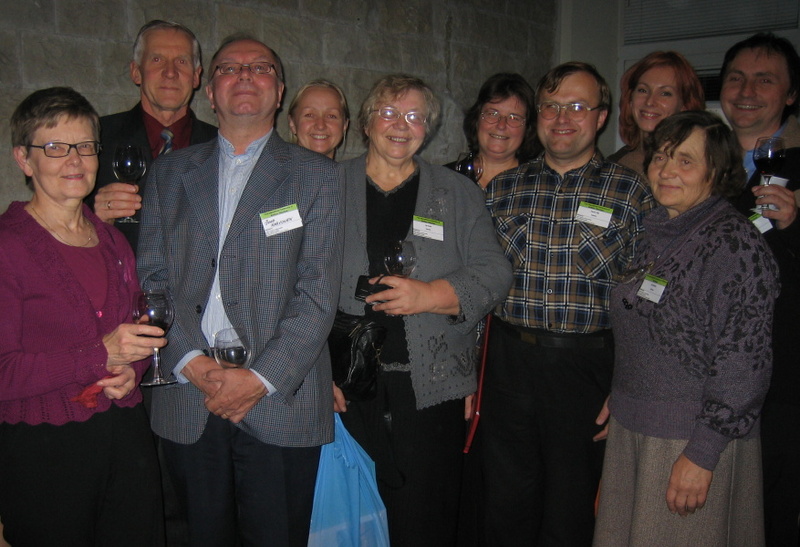 The wine fair of Estonian Sommelier Association took place in Tallinn. 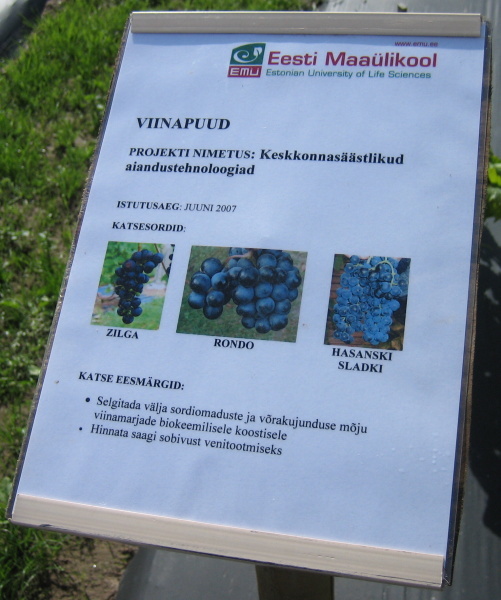 Some wines made by Estonian grape growers were tested there. Jaak Eensalu, Kertu Silla-Kuut, Felix Buschmann, Liia Kaska and Raimu Aas participated the event. The fermentation of my wines made this autumn has finished. 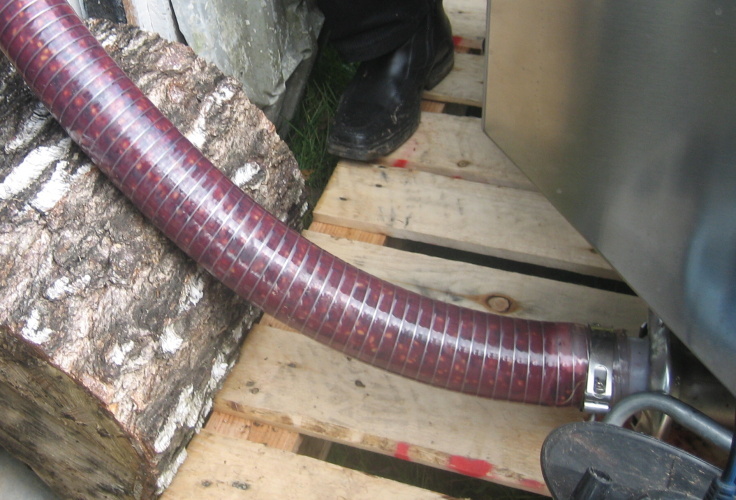 These are varieties used for winemaking: Scandia (18.09), Silva (25.09), JK 2-3 (26.09), Toldi (06.10), Supaga (22.10), JK 6-5 (07.11). There are the dates of starting fermentation in brackets. There was a very long and mild autumn in Estonia this year. The first real night frost was at last night. I picked berries of seedling JK 6-5 for making the ice wine today. 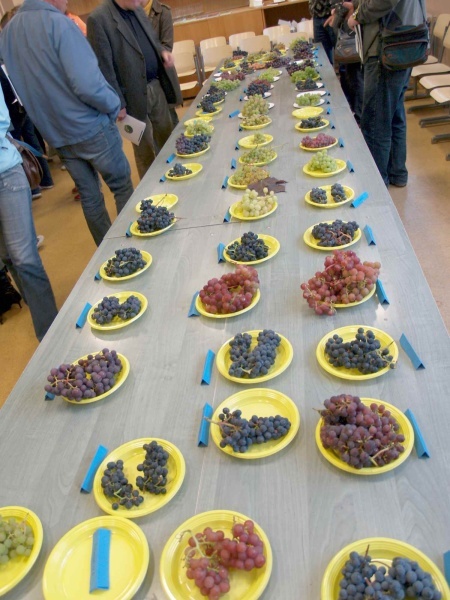 9 wines, some preserves and berries over 10 varieties were tested at first. Raimu Aas, Marje Reinvee, Aavo Eisen, Sirje Tooding, Liia Kaska and others have brought all these for testing. 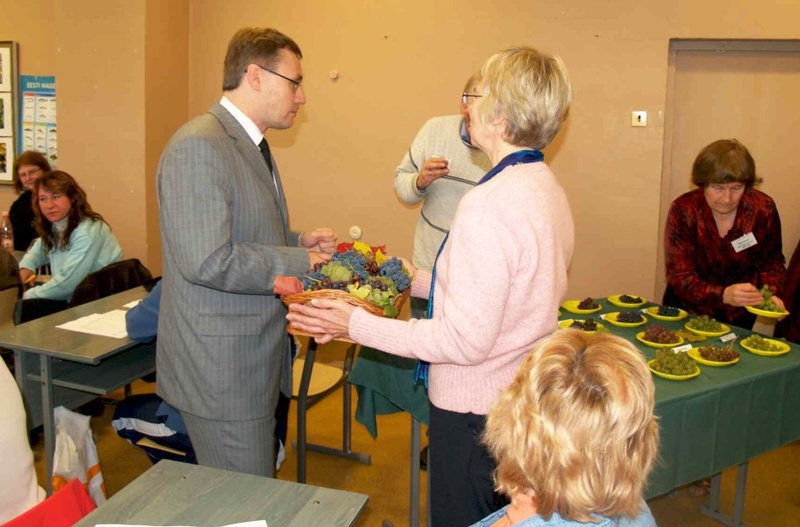 Minister of Education and Research Mr. Tõnis Lukas who visited Räpina that day, could test Estonian grapes here, too. 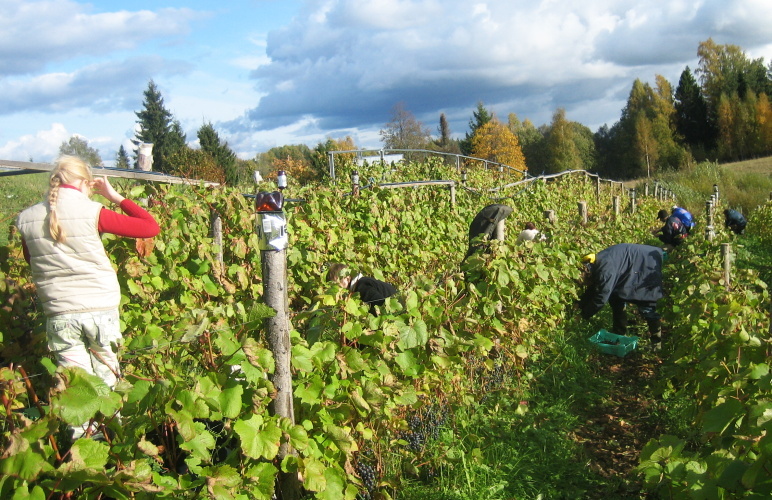 The main topic of the day was autumn cutting and covering of vines. 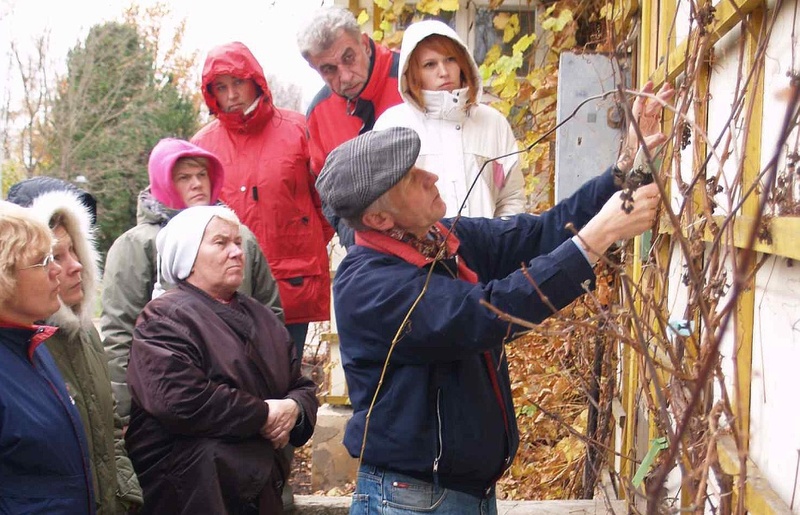 There were learnt how to use removed shoots for propagating grapes and for wicker-work. 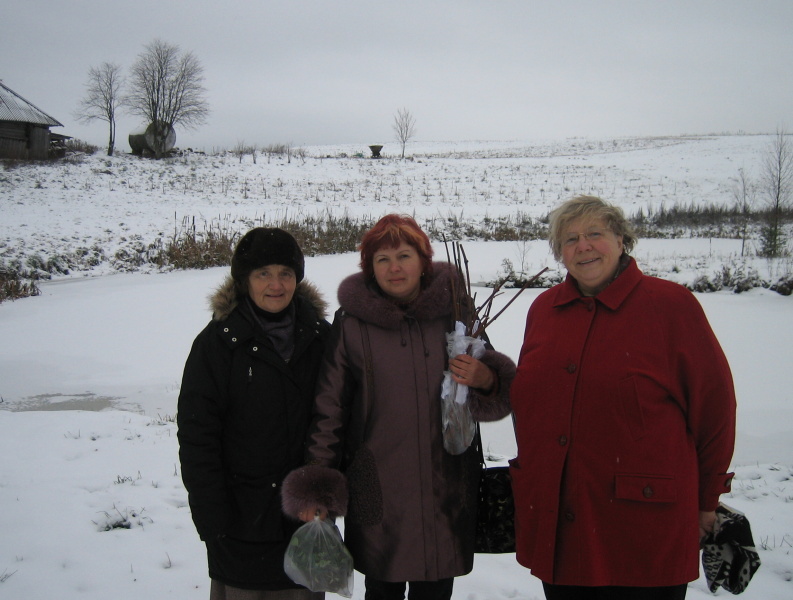 Liia Kaska told about varieties in her collection. 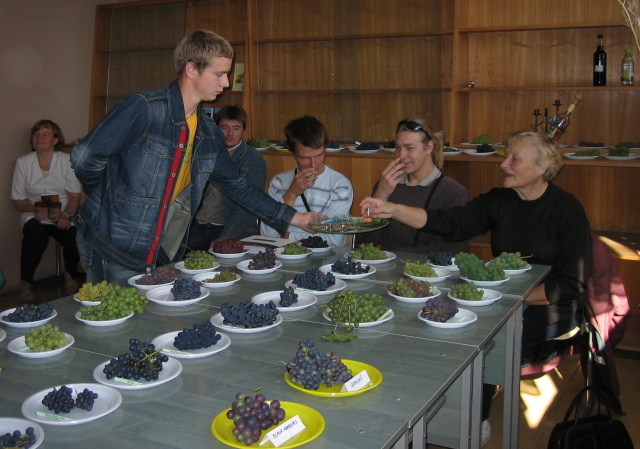 Over 30 persons participated in this training day and visited the grape species collection of the college. 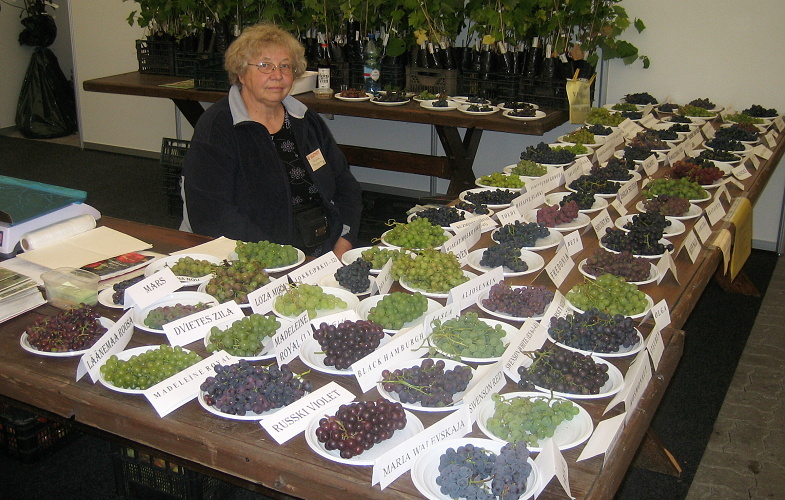 Liia Kaska participated there having along young plants and berries of 47 varieties. 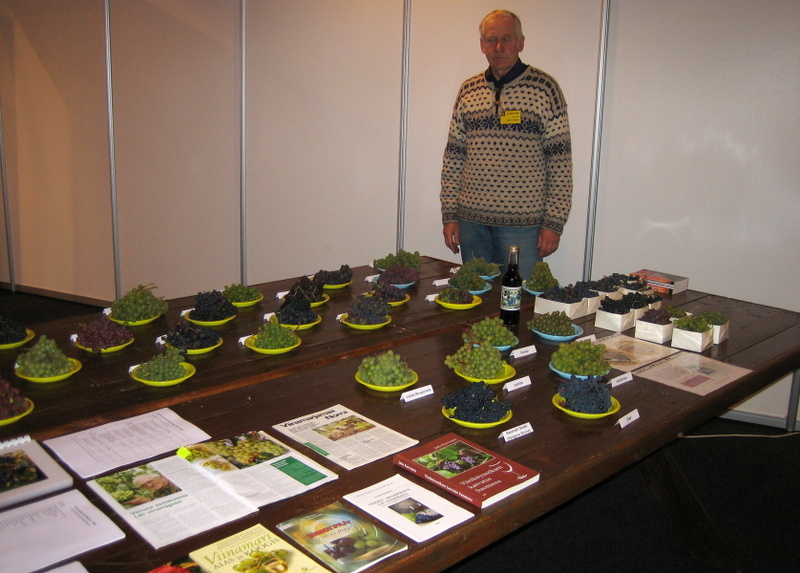 Räpina Gardening College presented 35 varieties. A new disease has appeared in Estonia. 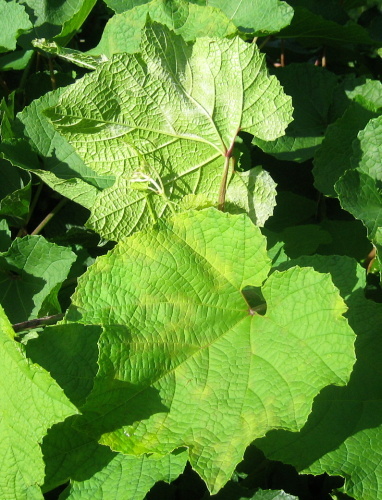 We noticed mildew (Plasmopara viticola) first on the leaves of 'Pamjat Dombovskoi' ['Tðornõi Bessemjannõi Zimostoiki'], 'Rondo' and 'Zilga'. 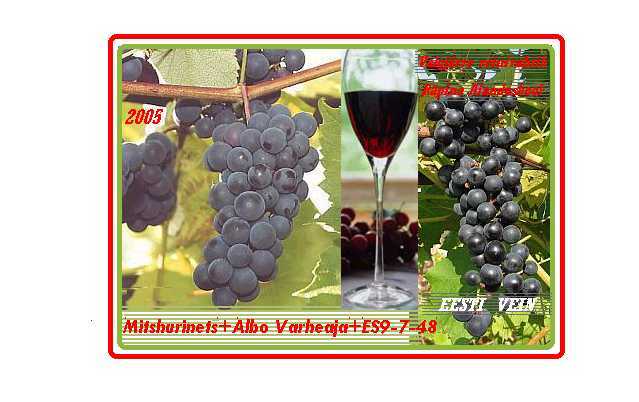 Plenty of varieties alike V. vinifera have been damaged later. 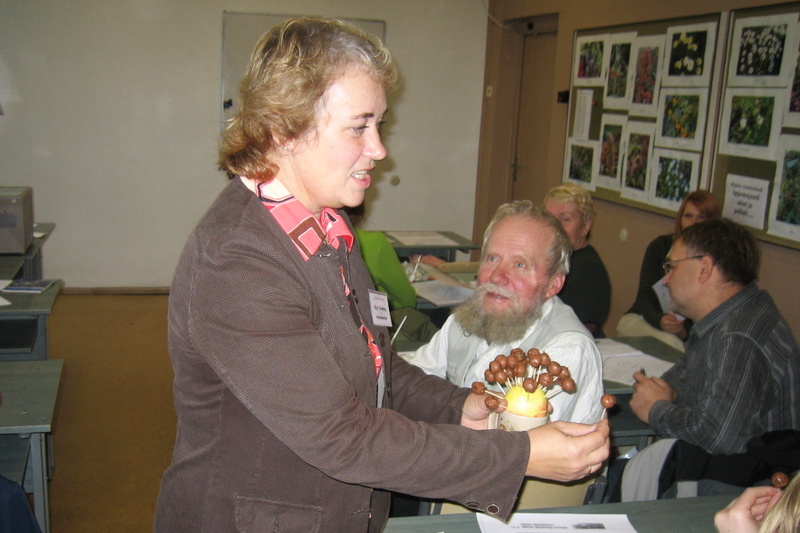 A TRAINING DAY has occured in Räpina Gardening College. Jaak Eensalu, Madli Jalakas, Harri Poom, Anneli Tiisler, Raimu Aas made speeches there. Participants visited Erki Ilmoja's, Tiiu Oja's and Ralf Räni's gardens. 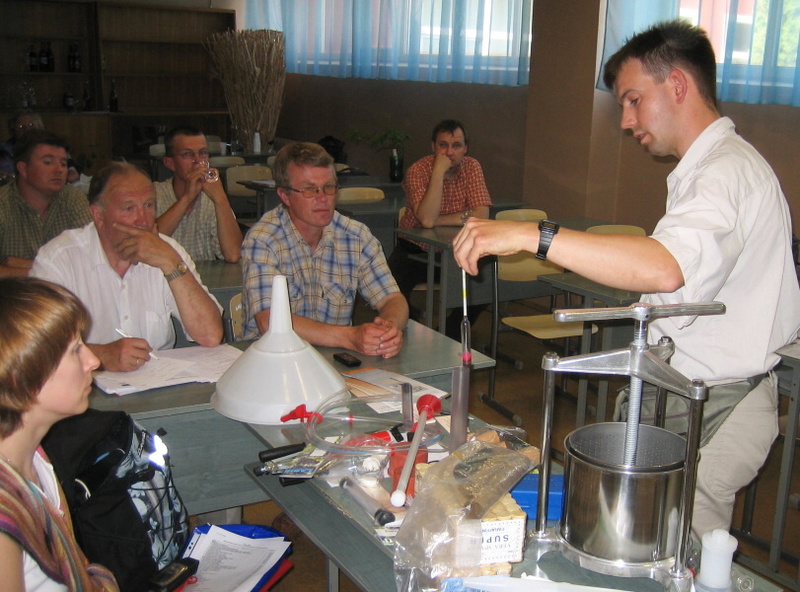 Richards Ivanovs from Latvia presented wine equipments. 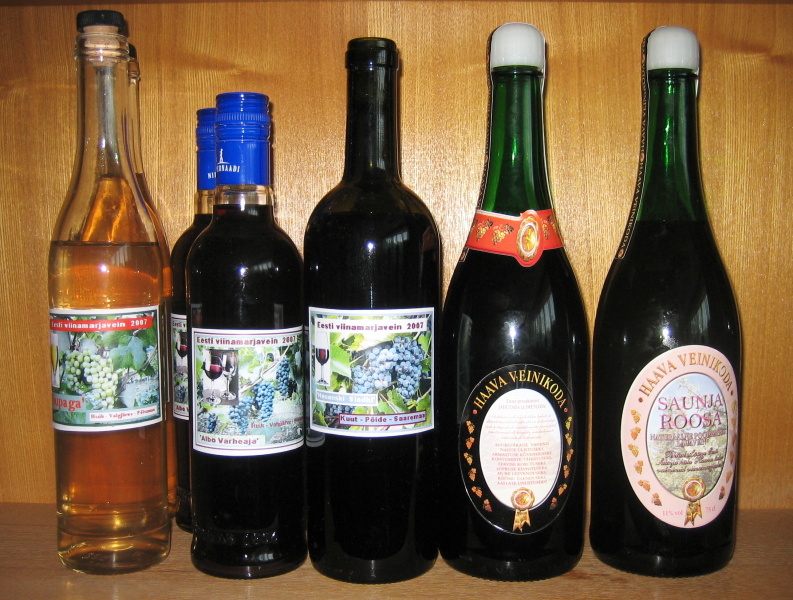 There were 9 grape wines for testing made by Raimu Aas, August Huik, Jaak Eensalu, Uku Kuut and Liia Kaska. The day has been realized by Räpina Gardening College, Estonian University of Life Sciences, AS Plantex, MTÜ Eesti Viinamari, Annemäe farm (Valgamaa, Otepää district), Saare-Tõrvaaugu farm (Pärnumaa, Vändra district), Pruuli-Kaska farm (Võrumaa, Sõmerpalu district), Haava farm (Läänemaa, Oru district) and Richard Ivanovs from Riga. 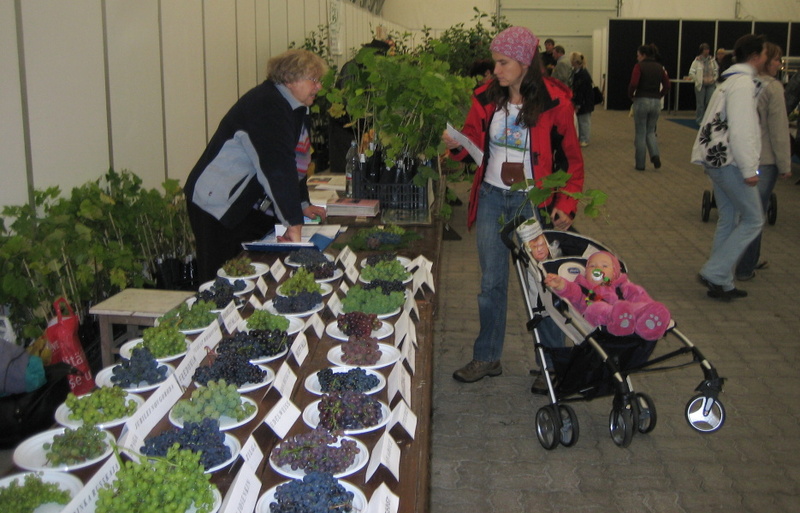 There were young plants, wines and books for sale. 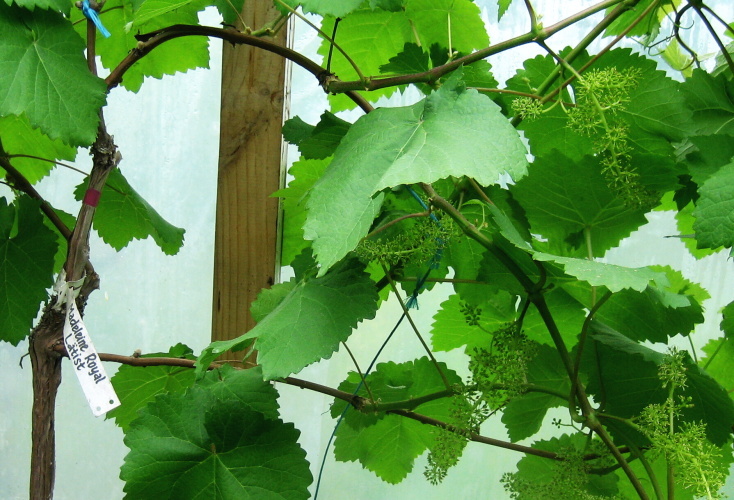 Some shoots of our grapes have been damaged by frost last night. Latvians Andris Dishlers, Girts Mikelsons, Edgars Zihmanis ja Elmars Kurshis visited Räpina. Juha and Anna-Liisa Karvonen from Finland visited Räpina. 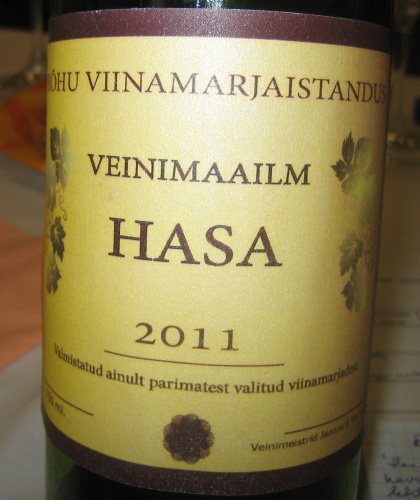 They put the Finnish grape wine on the market last year. 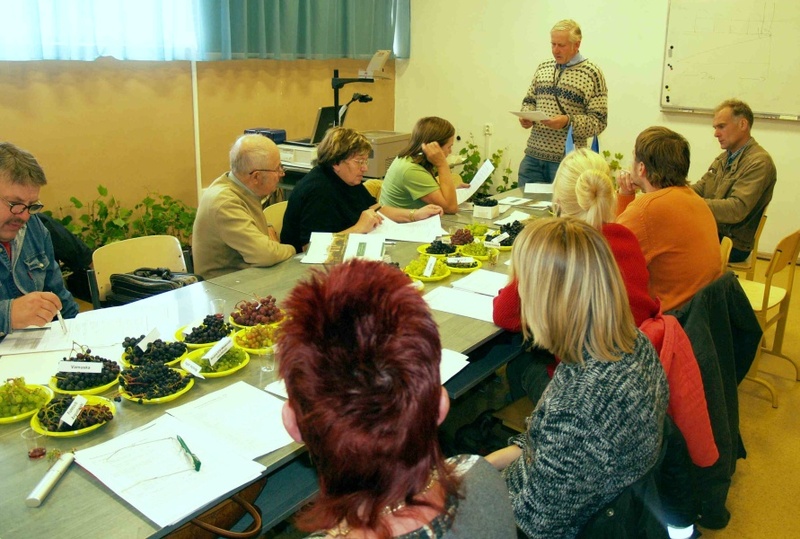 A TRAINING DAY "Grape as a commercial culture" has occured in Räpina Gardening College. 52 learners participated there. Kaspars Sunins, Gvido Dobelis, Andris Dishlers and Girts Mikelsons came from Latvia. HERE ARE data of the average taste of the participants and sugar content measured by Marge Starast and Andris Dishlers on 21.09.2007 at Räpina. 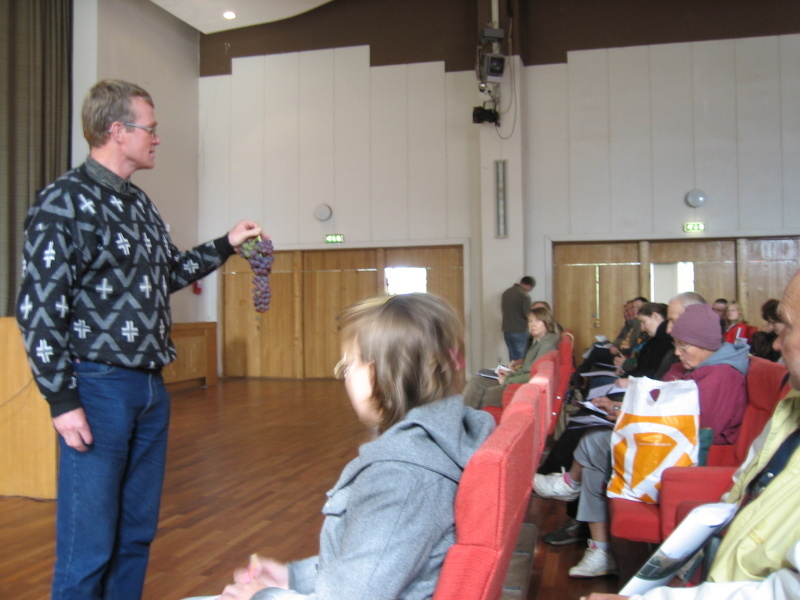 Headmaster Heino Luiga greeted participants. 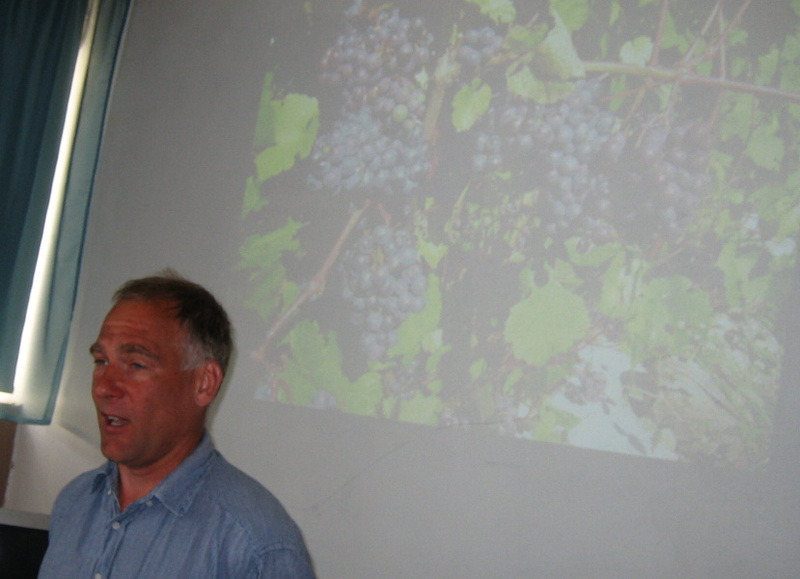 Opening speech was "Commercial grape varieties" by Jaan Kivistik. 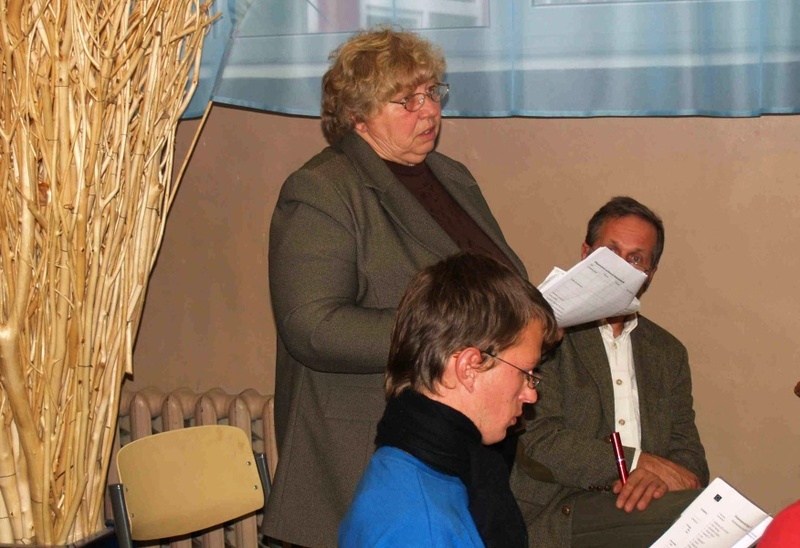 Marge Starast, Harri Poom, Uku Kuut, Gvido Dobelis and Andris Dishlers made speeches there. 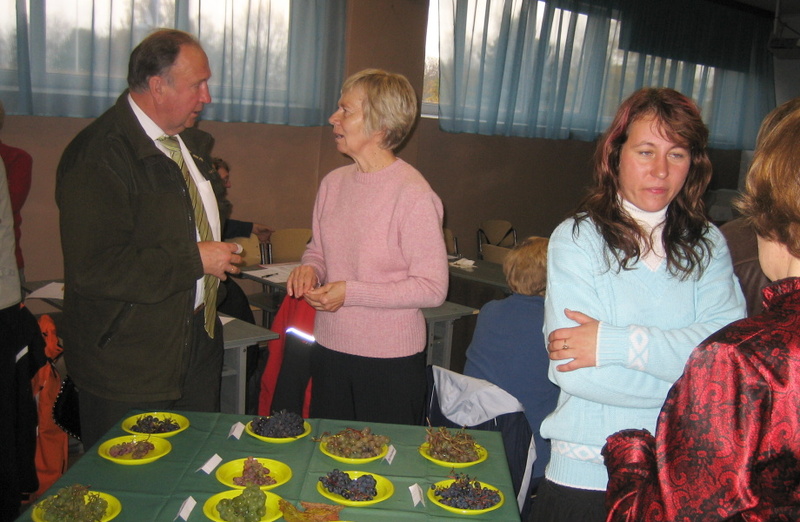 Over 50 varieties of berries had been presented on the exhibition. Uku Kuut storing berries for winemaking. Guests from Latvia visiting local sights next day. 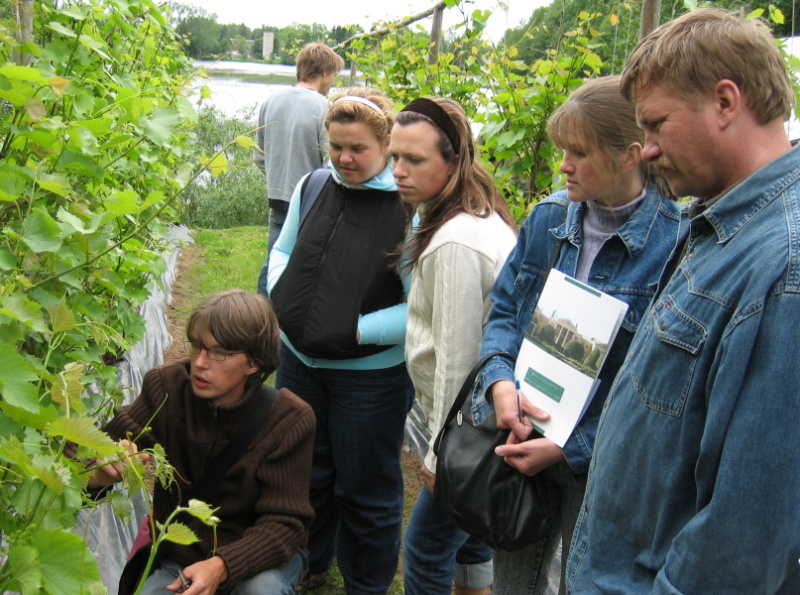 TRAINING DAY on the topics summertime pruning and local wines in Räpina Gardening College. 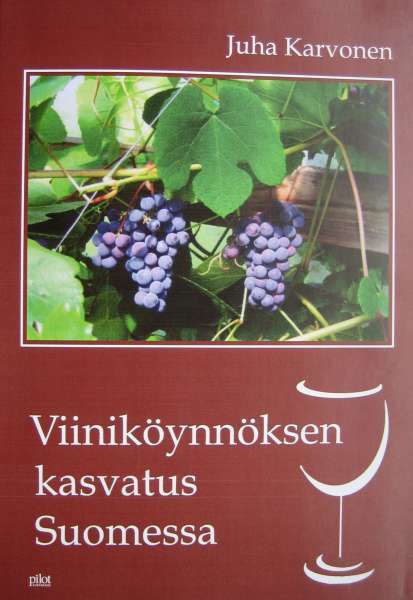 A NEW BOOK by Juha Karvonen about grapes has been published in Finland. 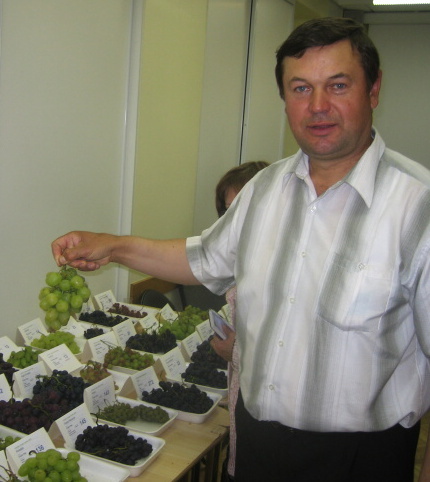 THREE ARTICLES about grapes were published in magazine "Maakodu". 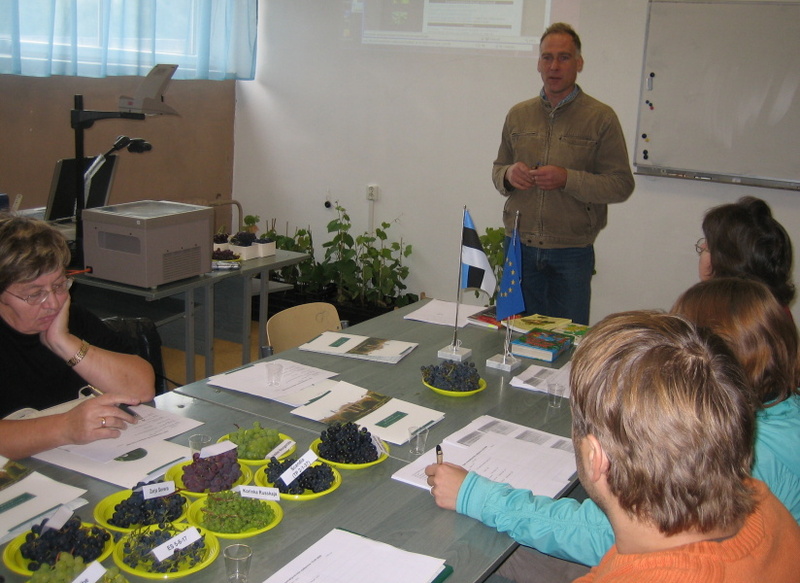 DISCUSSION "Grape growing in Estonia" at Estonian University of Life Sciences. 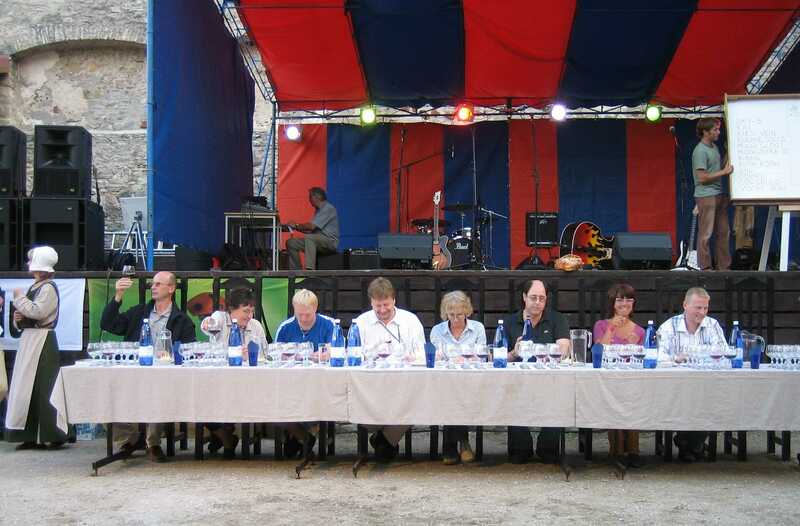 An organization of grape growers decided to establish there. 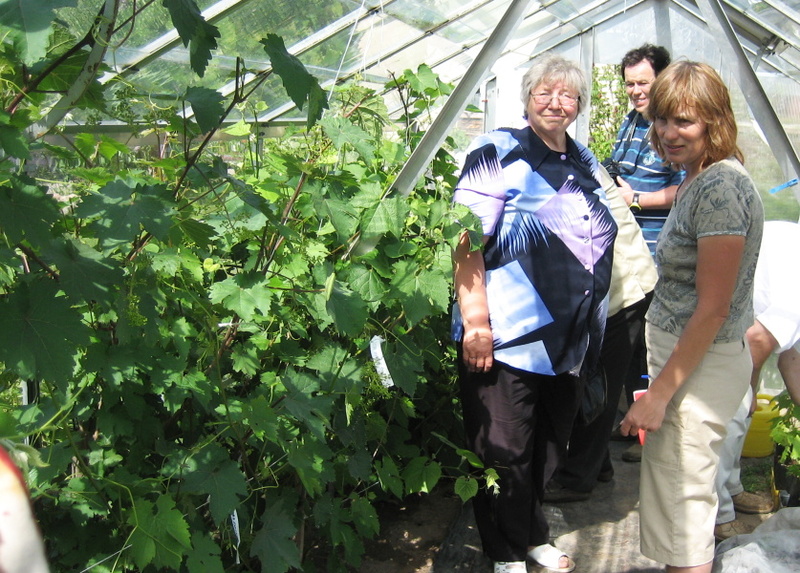 TRAINING DAY "Northern grape growing" in Räpina Gardening College. 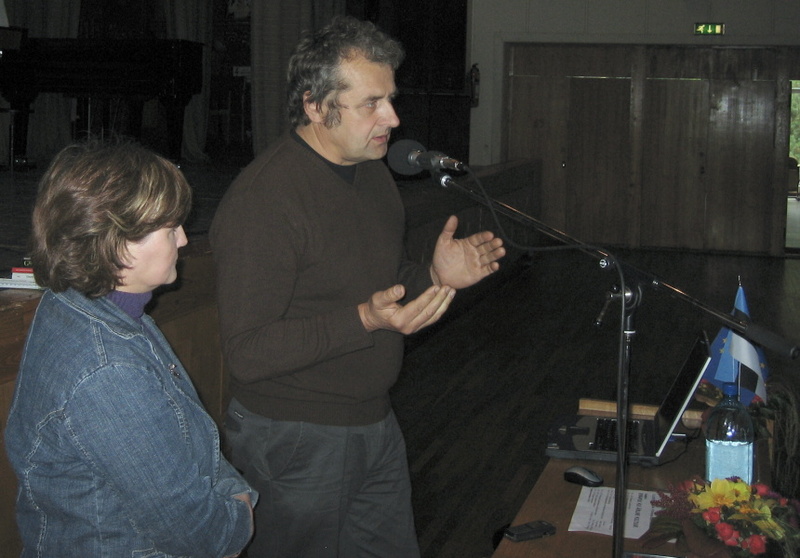 Uku Kuut and Kadri Karp spoke about the conference in Jurmala. 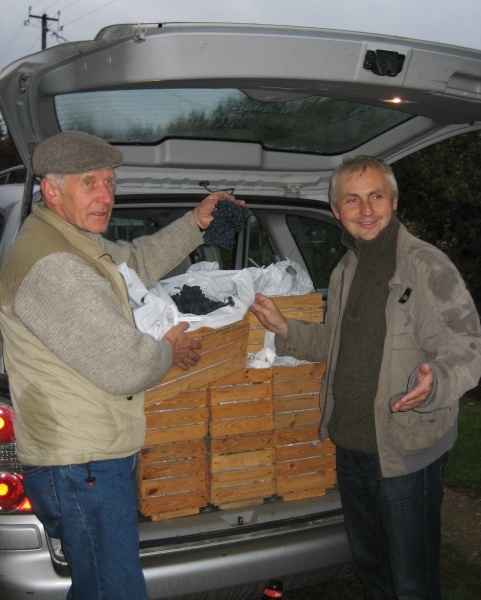 Autumn pruning and covering for the winter ahead were the basic topics that time. 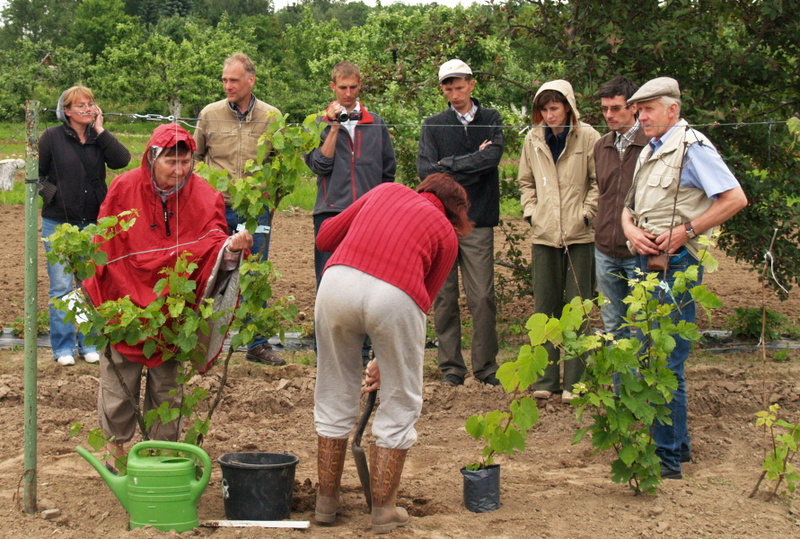 Participants in the lecture room and in the vineyard. Harri Poom, Sirje Tooding and Liia Kaska sharing their grape growing experiences. 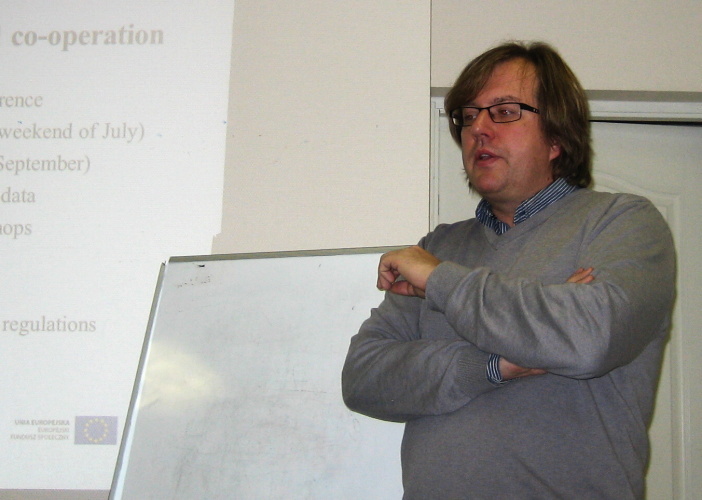 Felix Buschmann presenting the information about the grapes in Estonia. 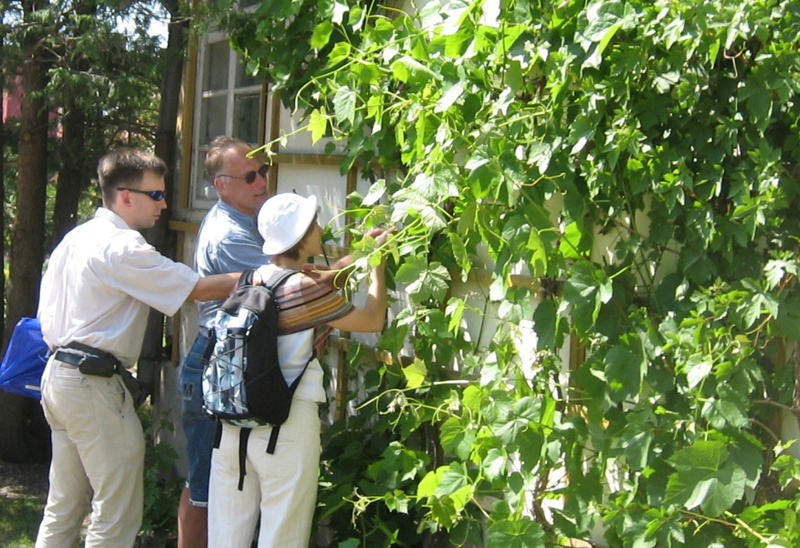 First International Conference of Northern Viticulture took place at Jurmala in hotel Lielupe. Participants had come from 16 countries. Latvia, Lithuania, Finland, Sweden, Norway, Denmark, Germany, Belgium, the UK, Poland, Byelorussia, Ukraine, Russia, Canada and the USA (Minnesota) participated there. 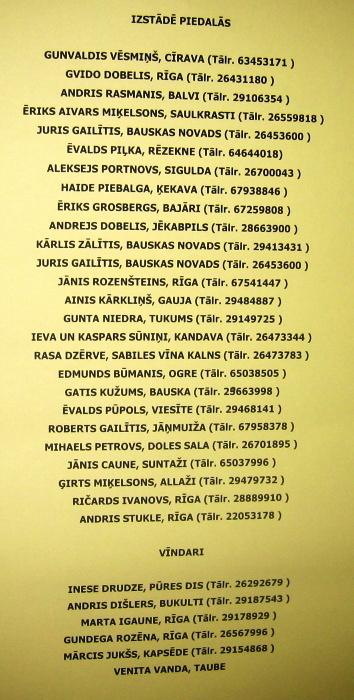 The participants from Estonia were Jaanus Jõgi, Liia Kaska, Aili Kivistik, Kadri Karp, Marge Starast, Taimi Paal, Kertu Silla Kuut, Uku Kuut, Harri Poom and Jaan Kivistik. 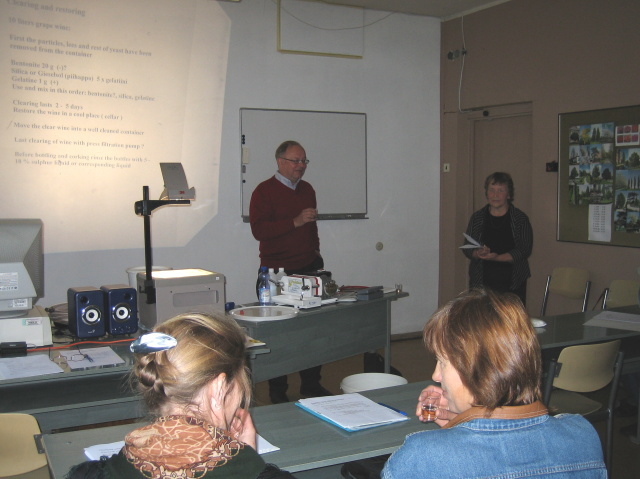 Anna-Liisa and Juha Karvonen from Finland among the participants from Estonia. 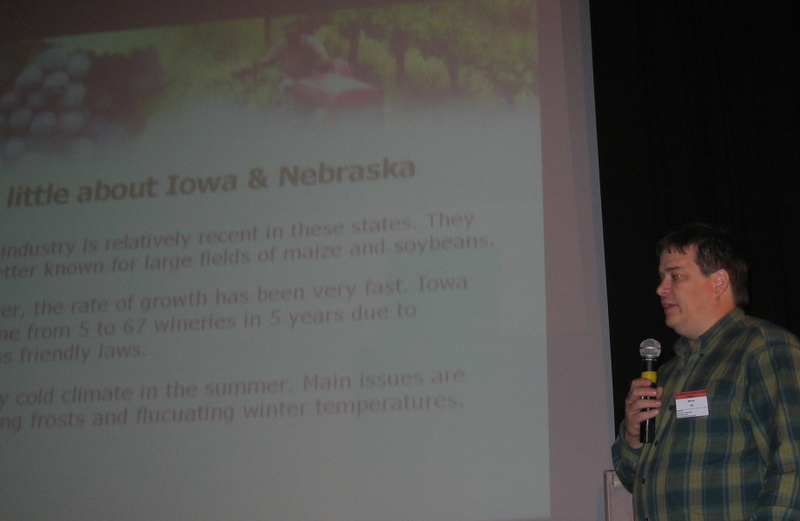 Harri Poom presenting a report about grapes in Estonia. Mark Hart from USA presiding the conference. 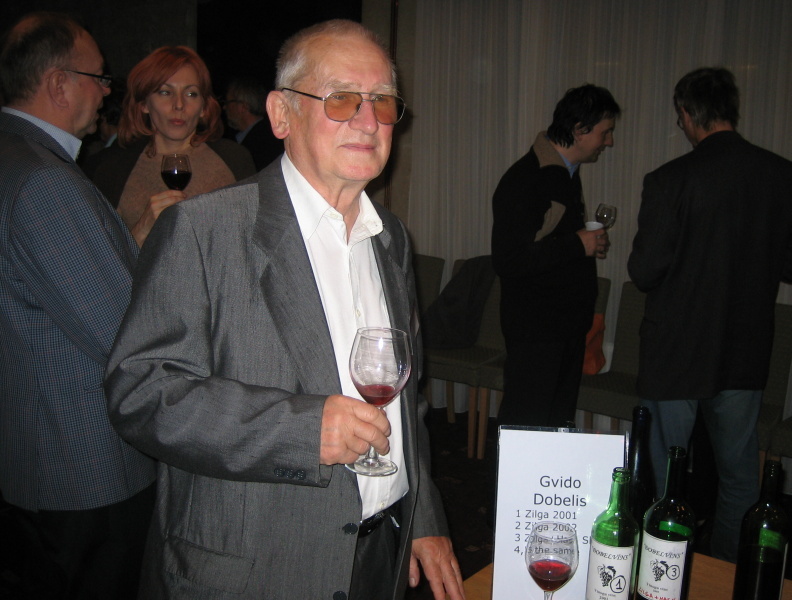 Gvido Dobelis is the leader of Latvian grapegrowers. 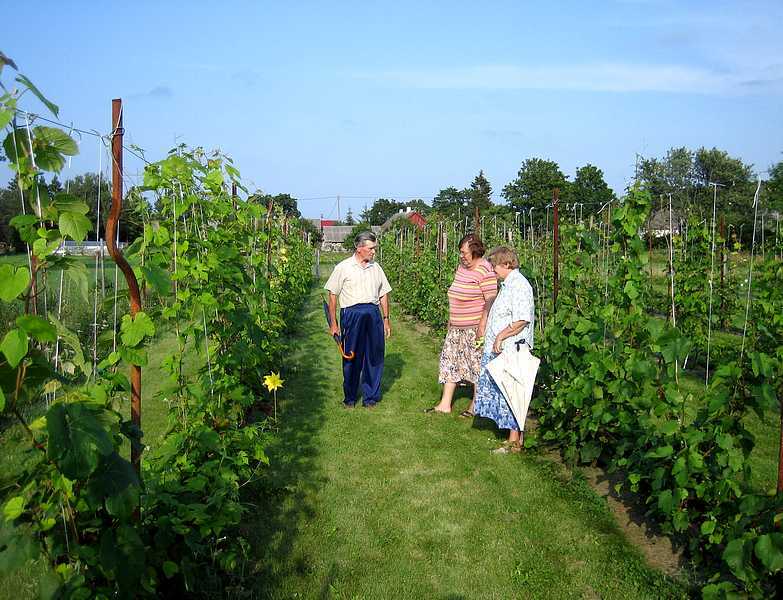 Visitors walking about Sabile vineyard. 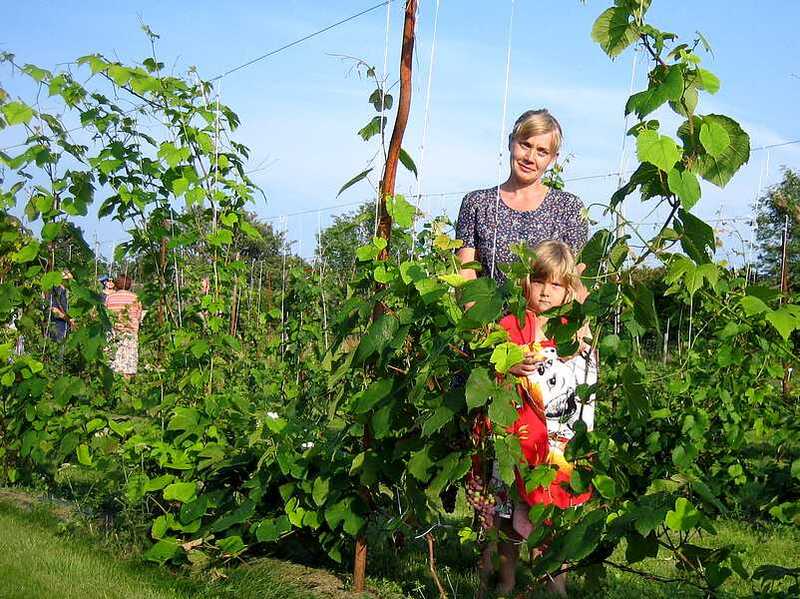 Kaspars and Ieva Sunins have established new vineyards in Kandava region. 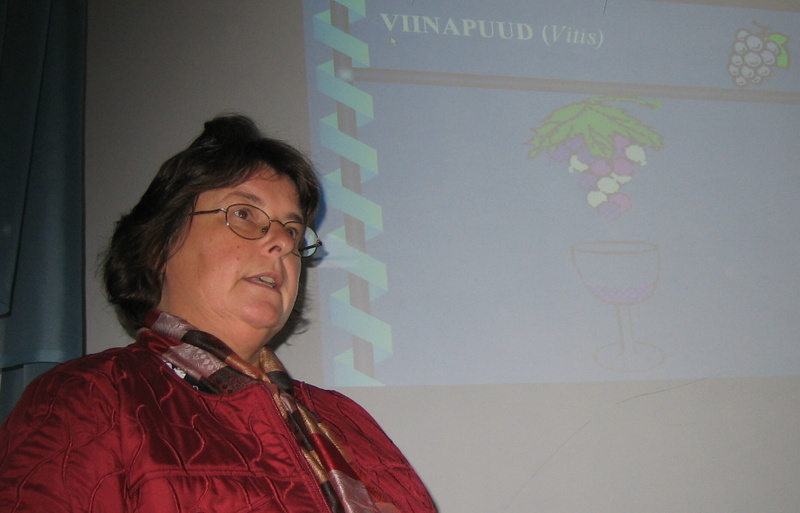 Tamara Jashtshenko from Altai visited grape collectors in Estonia after the conference. Girts Mikelsons from Latvia visited Räpina before his trip to the Far East region in Russia. OCTOBER 2006. In the last issue of magazine "Maakodu". 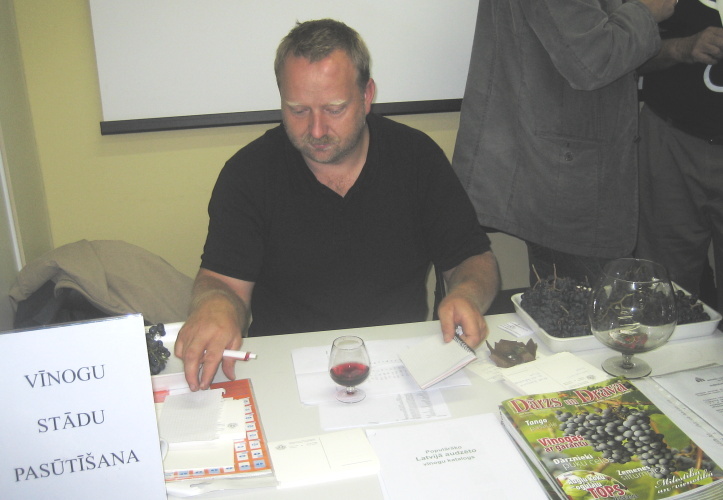 There is Juha Karvonen's news about wine festival at Sabile (page 80). 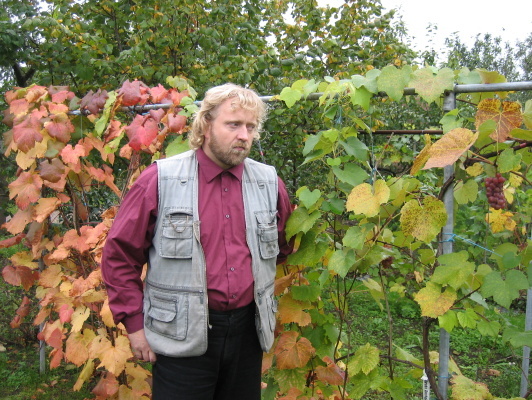 Raimu Aas (page 69) has got 70 grape varieties in his garden. 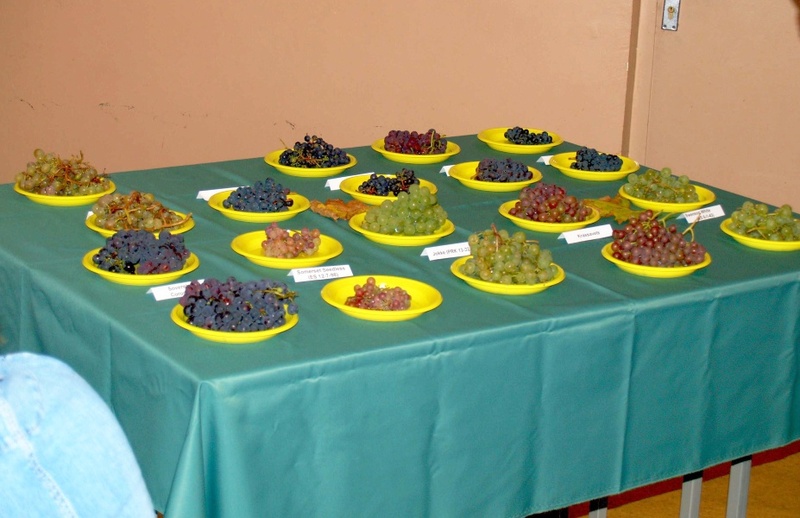 The exhibition of grape varieties and tasting berries and wines. 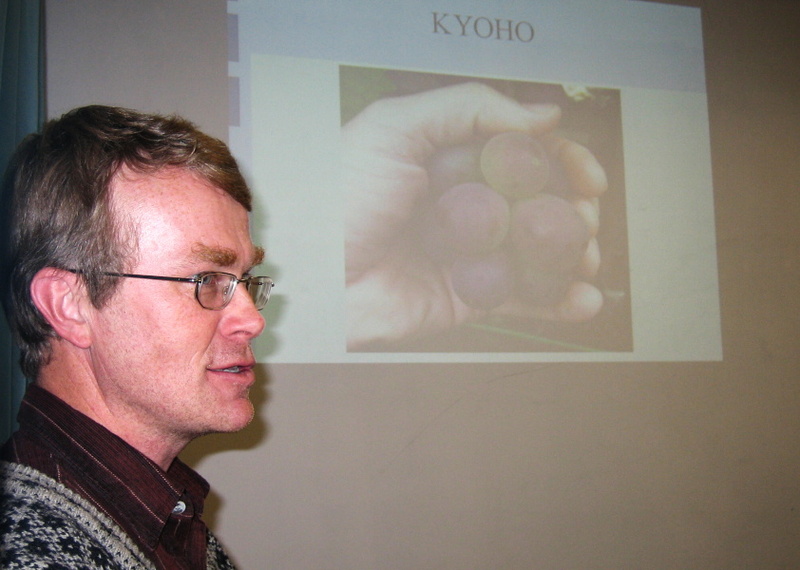 Juha Karvonen from Finland spoke about making wine. 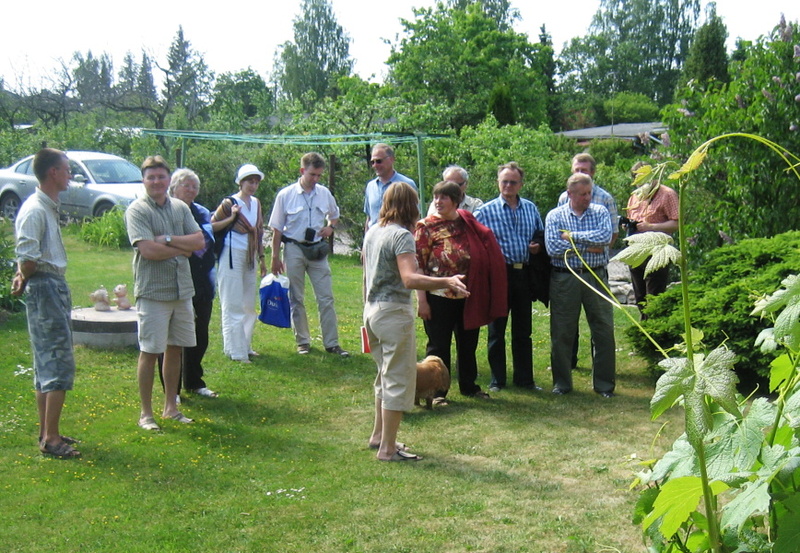 Visit to the vineyard of Räpina Congregation. 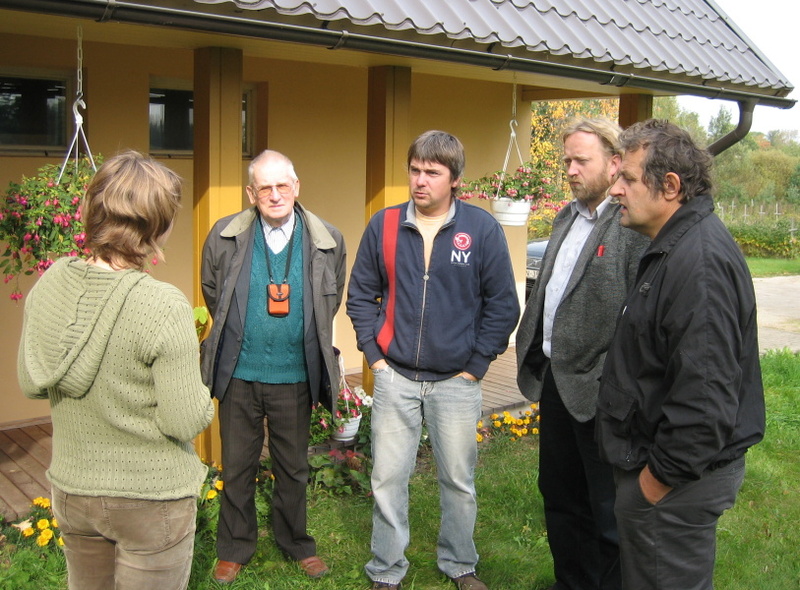 Visit to the garden of Ralf Räni. 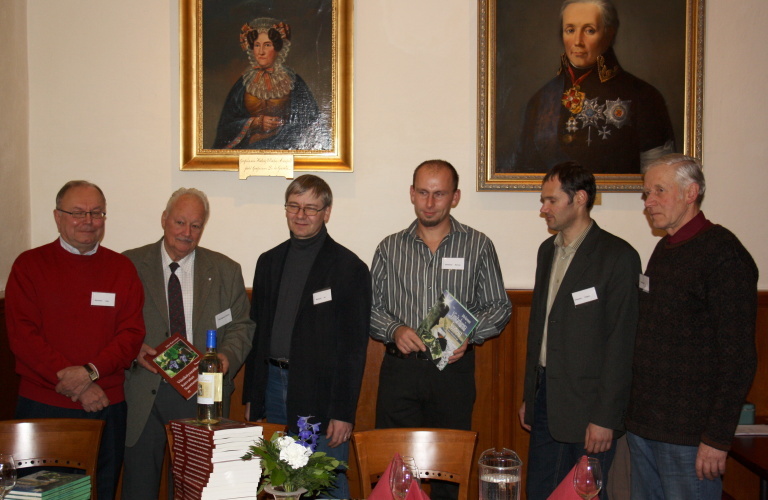 A NEW BOOK about grapes has been published by publishing house ILO in Tallinn. Several photos, figures, tables and some English text help non-Estonians to use the book. 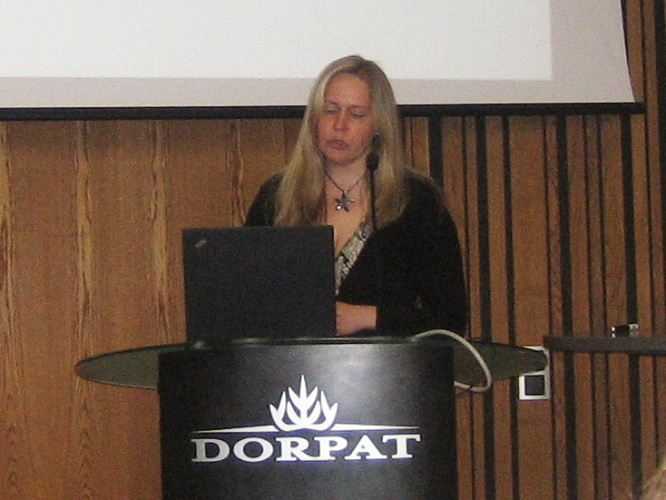 SA Räpina Kultuurkapital, Estonian National Culture Foundation and AS Plantex have subsidized composing the manuscript of the book. 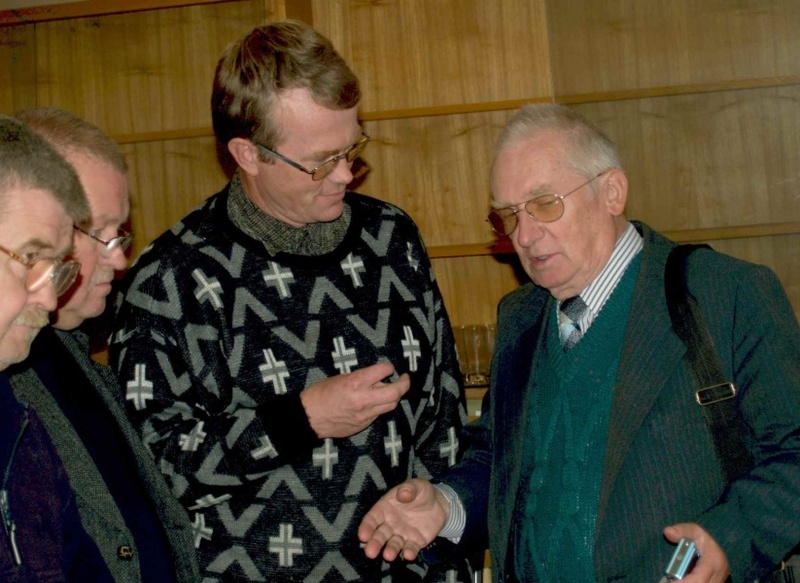 Eesti Kultuurkapital has subsidized the design of the book. 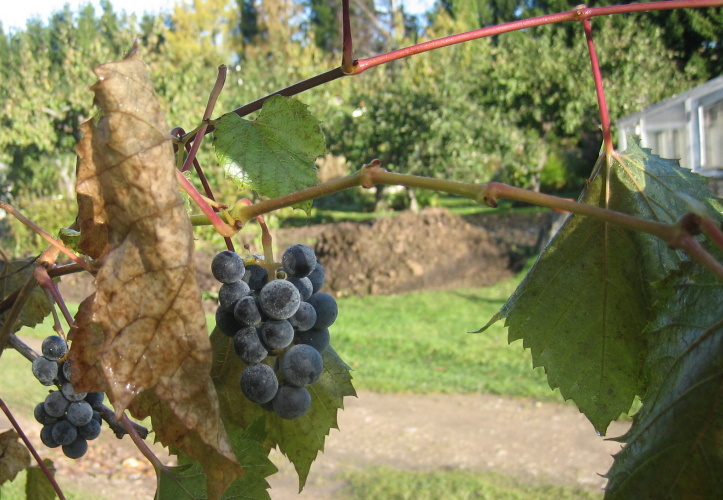 The book has been devoted to the friends of northern grapes. 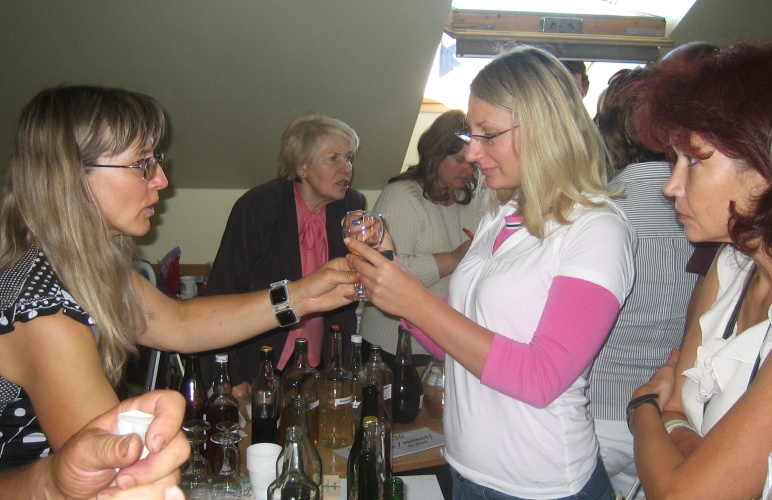 FINAL ROUND of competition "HOME-MADE WINE 2006" at Haapsalu. There was a wine "Dry-3" ('Albo Varheaja', 'Mitshurinets', 'ES 9-7-48') made by August and Ruth Huik among the 12 best participants. Tõnu Kark was the quide of evening. SUMMER PRUNING OF GRAPES. 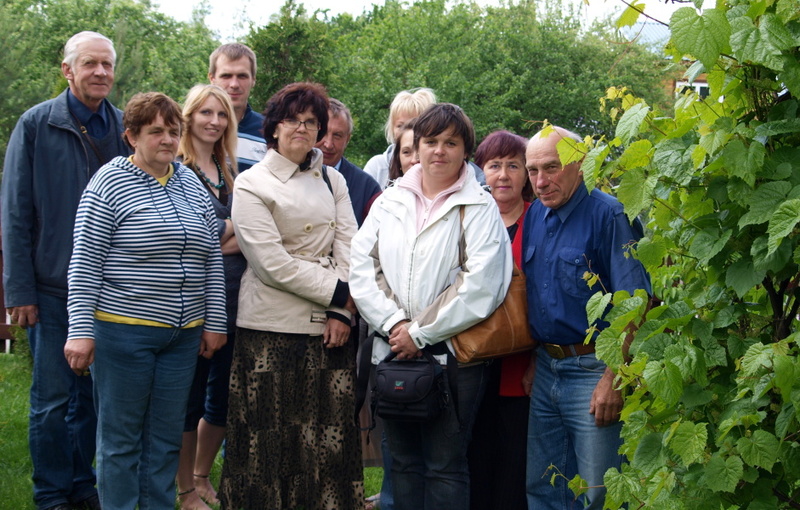 A group of people interested in grapes visited Ralf Rani's garden and vineyard of the congregation of Rapina . Ralf Rani lets only 6-8 long canes for fruiting to his grape 'Triumph'. WINTER DAMAGES. In January there were -30 *C at Rapina. The snow cover was thin, only 7 cm that time. 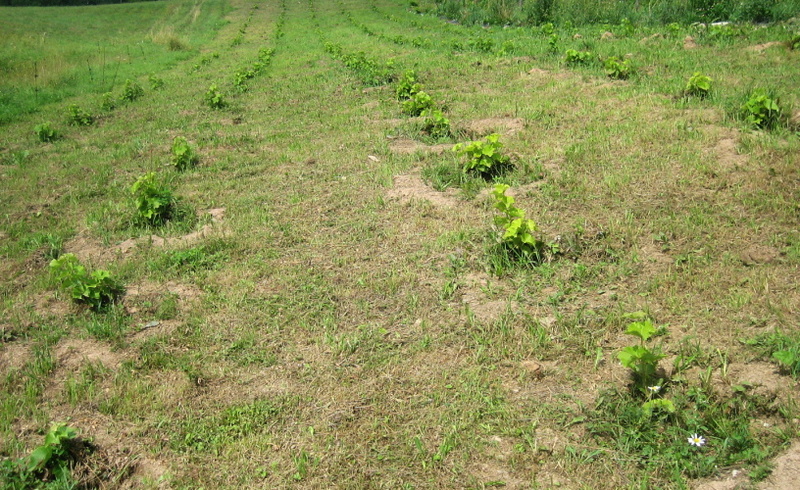 Several varieties have got winter damages. 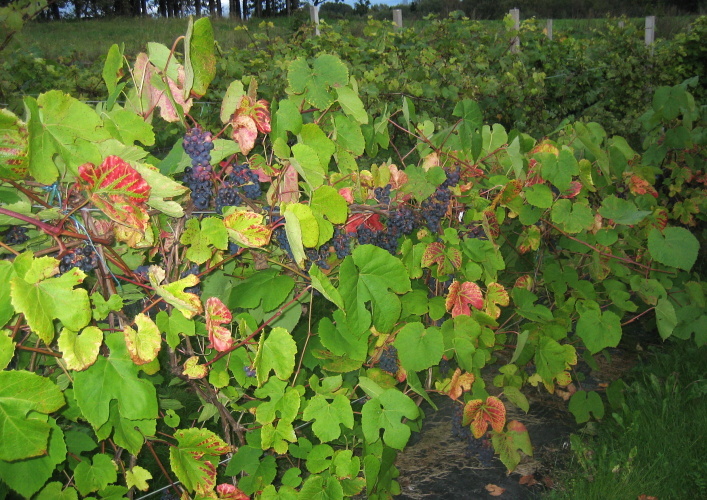 Vitis riparia and its varieties hibernated well without winter cover. 'Sipaska', 'Valiant', 'ES 9-7-48', 'ES 5-3-57' do not have any winter damages. Varieties of V. labrusca have been damaged more. 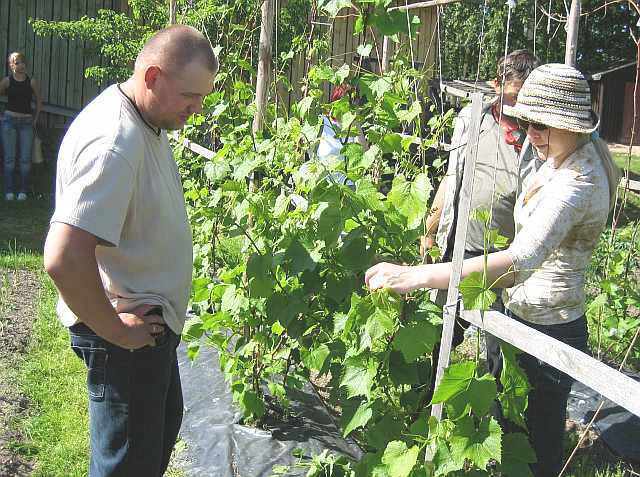 APRIL 2006 The president of Society of Latvian Vingrowers and Winemakers Gvido Dobelis writes about grape growing in Latvia in Estonian magazine "Maakodu". 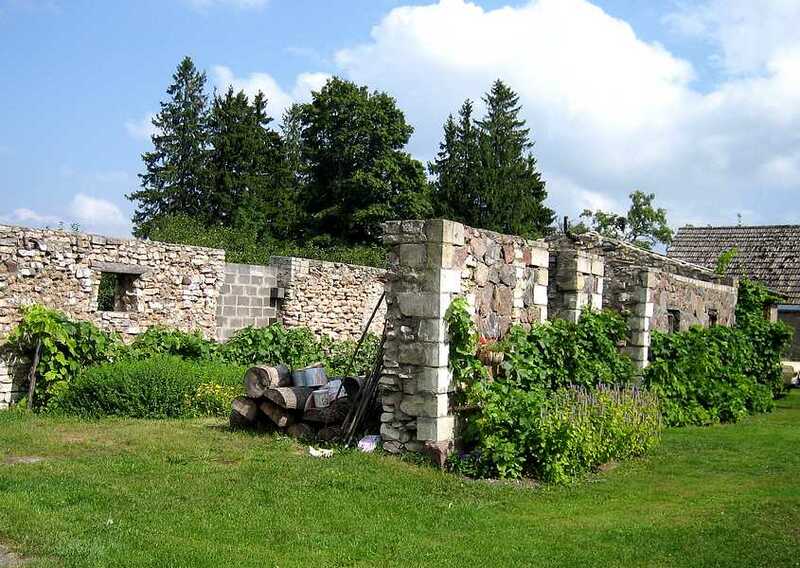 You can read about famous northern Sabile vineyard in the same issue. 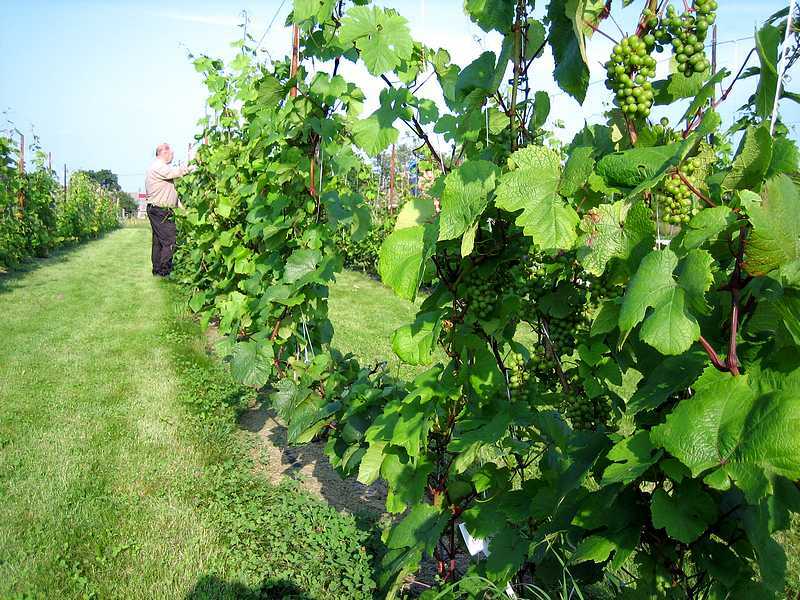 JANUARY 2006 The International Association for Northern Viticulture (IANV) was established as an unincorporated non-profit organization in the state of Wisconsin (USA).